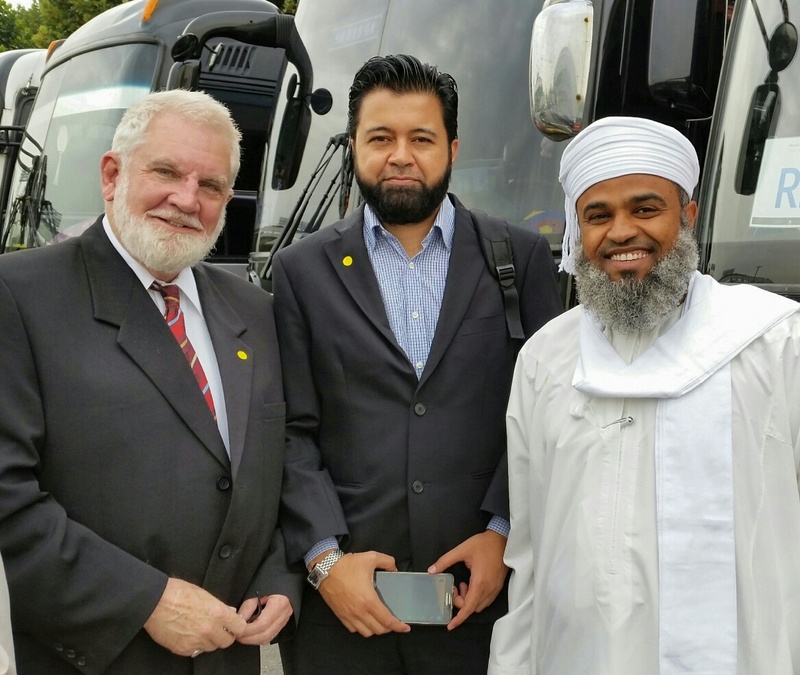 During September and October 2016, an MVPR peace mission team traveled from Jeddah, Saudi Arabia to Washington, DC and Annapolis, Maryland and then on to Chicago, Los Angeles, San Francisco, Beaverton (Oregon) and Seattle. We met with churches and Christian groups and visited mosques, providing information about MVPR’s peacemaking efforts. Here is a short video produced by videographer Kienan Mamoun who accompanied our team. O’Neill’s Pub now occupies the former Muswell Hill Presbyterian Church in North London. The church closed for lack of interest and contributions. Recently I had the opportunity to visit the United Kingdom. Most of my time was spent in my ancestral homeland Shropshire County on the border of Wales. 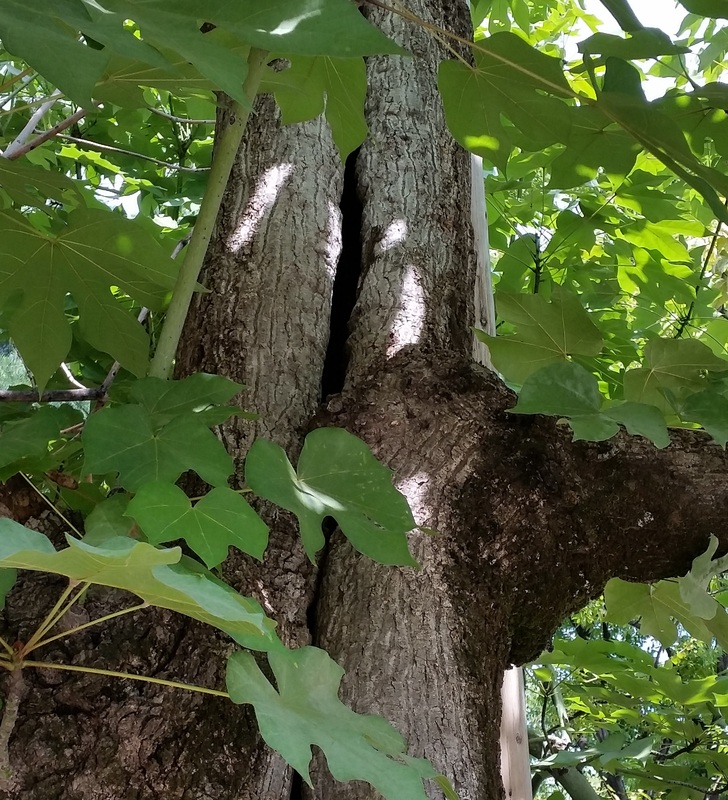 I went there to get a close look at the spiritual history of the land; and what I discovered was profoundly surprising. I found that the God of Abraham the English once sought in Christian churches and Jewish synagogues is now more likely to be worshiped in Muslim mosques! Sadly many churches have closed, and many of the buildings have been converted to bars, dance clubs, skate boarding rinks and grocery stores. There are now six mosques in Shropshire–five of them opened in former church buildings. Mohammed Abbasi of Football for Peace with Paul Armstrong, director of the Association of British Muslims. In England Islam is growing rapidly, and the numbers of Muslims worshiping faithfully is increasing daily. Islam is expected to become the most dynamic religion in the United Kingdom in just 10 more years. According to the British online journal The Mail (2 September 2016), “Mohammed,” for the second year in a row, remains at the top of the list of most popular baby boy names in England and Wales. 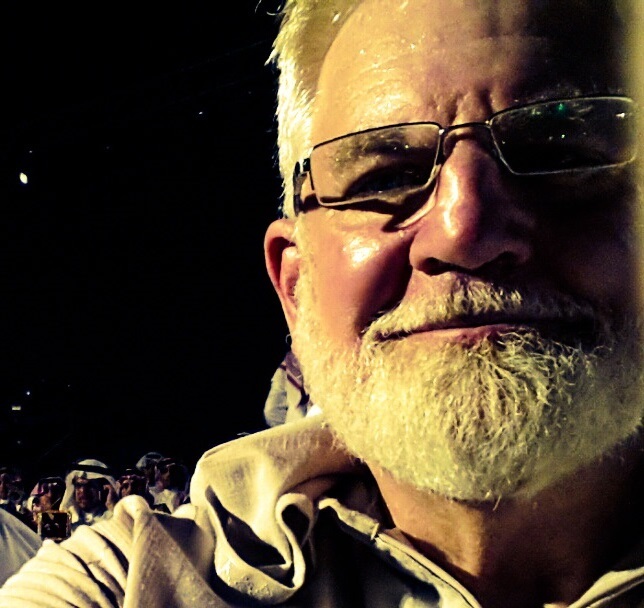 Quite a few former Christians are finding Islam to be more loving, kind and emotionally supportive than the cold, dying Christianity offered by the more traditional denominations. As British men and women are finding Islam to be a “living faith” to their liking, closed church buildings are finding new life in Islam. He told me he identified with the concerns of Muslims who preach modesty and dedication to family life and service to others. “They are more what I think Christians ought to be,” he said. While the world’s population is projected to grow 35 per cent before the middle of the century, the number of Muslims is expected to increase by 73 per cent–from 1.6 billion in 2010 to 2.8 billion. In 2010, Muslims made up 23.2 per cent of the global population. Four decades later, they are expected to make up about three-in-ten of the world’s people (29.7per cent), the Washington, DC-based think tank said. Sam met with Abdurraheem Green, an English convert to Islam and founder of Islamic Education & Research Academy (iERA). In the short time I was here I was able to a number of Muslim leaders here in Shropshire County. I was particularly impressed by the outreach of the faithful at Telford Central Mosque and the Shropshire Islamic Foundation. Members of the six Shropshire mosques are offering spiritual counseling and organizing shelter to the homeless. They are reaching out to refugees who are fleeing war and offering healthcare and other assistance to needy British individuals and families. I was honored also to meet Abdurraheem Green, founder of the Islamic Education & Research Academy (iERA), a dynamic organization based in Shropshire. Abdurraheem is a Muslim convert who is known in Muslim communities for his work on Peace TV and Huda TV and on college and university campuses. For the better part of 30 years, Green has been active in the field of dawah, inviting people to Islam. I am grateful to Abdurraheem for having invited me to his home for dinner and introducing me to his wonderful family. (He has been blessed with 10 children!) He told me about his work with iERA. I was captivated by his genuine, meek and beautiful spirit. I found him to be a man full of God’s grace and mercy. Also, meeting with me at the Telford Central Mosque were Mohammed Abbasi of Football for Peace and Paul Salahuddin Armstrong, director of the Association of British Muslims–the UK’s oldest Muslim organization. I was deeply impressed by the fervent spirit of all these leaders and all the Shropshire Muslims I met. Their desire to make a positive difference in the lives of broken and needy people was clear. The question we Muslims must ask is, what kind of Muslims will be produced simply by birth statistics? It is not enough to say that one is Muslim simply because he or she was born to a Muslim family. Yes! Those who are born Muslim must be imbued with a living faith–given to self-denial and to prayer and service to others. I have heard it said often by Muslim leaders travelling from the Middle East to the West, “In the West we have seen ‘Muslims’ without Islam, and here in the Middle East we often find Islam without Muslims.” In other words the outward manifestation of faith is not always evident in the lives of those who consider themselves Muslim simply by birth. Since 2011 Islamic Relief for victims of war has expanded nationwide. Thousands of British Muslim men and women serve as volunteers. It is not enough to say one is born Jewish, Christian or Muslim. Truly, a vibrant, heart-felt, life-changing Islam is needed in England and our world today—not a religion of just traditionally “born Muslims.” I am talking about a living faith most evidenced by the truly concerned humanitarian servants it produces. One must believe and act accordingly to the dictates of faith! Of what value is a Jew who does not truly worship wholeheartedly the God of Abraham? Of what value is a Christian who does not follow and obey the teachings of Jesus (pbuh)? And similarly, what good is a Muslim who simply says he is Muslim by birth, but does not submit daily to God, observing and obeying the truths of the Qur’an and all God’s prophets? Among early Christians the issue of faith and works was fiercely debated. James, the brother of Jesus, wrote, “What good is it, my brothers, if someone says he has faith but does not have works? Can that faith save him? If a brother or sister is poorly clothed and lacking in daily food, and one of you says to them, ‘Go in peace, be warmed and filled,’ without giving them the things needed for the body, what good is that? So also faith by itself, if it does not have works, is dead” (Injil / Epistle of James 2:15-17). And we have this promise from God in the holy Qur’an, “Those who believed and did good works, We shall blot out their transgressions and shall reward them according to the best of that which they used to do” (Qur’an / Al Ankabut 29:7). It is absolutely true that genuine faith will be evidenced by the good works we are commanded to do. God desires obedience from each of us. Ours must be a pure faith planted miraculously in the hearts of men, women and children by the very God of Abraham (pbuh), transforming those who believe into servants of God and providing hope and direction for all mankind. The British Religious Society of Friends (Quakers), one of the oldest Christian denominations in England, has developed strong ties with Muslims in a number of communities. Most recently, Quakers and Muslims have realized a working union on several levels–a powerful force for reconciliation and peace. These positive dimensions, they say, stem from “the love of God and of neighbor, and are at the heart of both Muslim and Christian faiths.” Quakers are working to develop peaceful understanding both locally, nationally and internationally with their Muslim brothers and sisters. Islam is not new to England. Its positive influence on British society began in the 19th century. Please take a few minutes to watch the following BBC documentary about the history of Islam in England. Here you will hear the little-known story of three British leaders–William Quilliam, Baron Headley and Marmaduke Pickthall–who embraced Islam at a time when to be a Muslim was to be seen as a traitor to the Church of England and to the Crown. This superb BBC program looks at the amazing achievements (good works!) of these three men and how their legacy lives on today. Samuel Shropshire speaks at rally to welcome Syrian refugees to Bratislava, Slovakia. The rally was organized by Slovak Catholics and Muslim Voice for Peace & Reconciliation (MVPR). Working together we can accomplish great things for God and humanity. More than 1.3 million refugees had crossed into Europe by March, 2016. They came by land and sea. This influx of refugees sparked a crisis as countries struggled to cope with the millions of arrivals. It created division in the European Union over how to best deal with resettling people. While Sweden, Germany and Austria offered an immediate welcome, some nations gave way to right-wing extremists and racists, refusing to help. While the vast majority of refugees arrived by sea, many chose to walk to freedom and safety, principally via Turkey to Greece and then Albania and northward! Most hoped to reach Western Europe to join relatives already resettled there. Adding to the horror of the crisis was the number of deaths occurring at sea. Now, nearly two years into this crisis, refugee ships continue making the crossing, some sinking in the Aegean and Mediterranean seas. And just this past week came a battered, blue-decked vessel that flipped over on Wednesday as terrified migrants plunged into the waters of the Mediterranean. The next day, a flimsy craft capsized with hundreds of people on board. And on Friday, still another boat sank into the deceptively placid waters. Now another week and three sunken ships are again confronting Europe with the horrors of its refugee crisis, as desperate people trying to reach the Continent keep dying at sea. At least 700 people from the three boats are believed to have drowned, the United Nations refugee agency announced on Sunday, in one of the deadliest weeks in the Mediterranean in recent memory. Most, attempting to escape war, terrorism, poverty and starvation in their homelands, are desperate to reach Europe, Canada and America, where they believe a new and better life awaits them. But what they face in the West, in some cases, is extreme opposition based on misguided fear, anger and racism. Since April 2015, the European Union has struggled to cope with the crisis, increasing funding for border patrol operations in the Mediterranean, devising plans to fight migrant smuggling, launching Operation Sophia and proposing a new quota system to relocate and resettle asylum seekers among EU states. Individual countries have at times reintroduced border controls within the Schengen Area, and rifts have emerged between countries willing to accept asylum seekers and others trying to block their arrival. According to Eurostat, EU member states received over 1.2 million first time asylum applications in 2015, a number more than double that of the previous year. Four states (Germany, Hungary, Sweden, and Austria) received around two-thirds of the EU’s asylum applications in 2015, with Hungary, Sweden, and Austria being the top recipients of asylum applications per capita. The main countries of citizenship of asylum seekers, accounting for more than half of the total, were the war-torn nations of Syria, Iraq and Afghanistan. The conflict in Syria continues to be by far the biggest driver of refugees. But the ongoing violence in Afghanistan and Iraq, abuses in Eritrea, as well as abject poverty in Kosovo, are also leading people to look for new lives elsewhere. According to the UN, there are more 60 million refugees in today’s world. And some nation’s are not at all friendly to these men, women and children who are seeking safety and a better life. After Slovakia, the Czech Republic and Hungary, came out last year against taking in refugees, the great majority of which are Muslim, Cyprus and other nations have also sought to block refugees from entering their nations. Dominik Smrek and Shropshire address crowd of several hundred Slovaks in Bratislava. They came to encourage support for the refugees coming from Syria, Iraq and Afghanistan. Some have sought to reject refugees simply based on their religious beliefs. Slovakia’s Prime Minister Robert Fico also complained about the flow of refugees, setting an arbitrary number of “200 Christians” to be received. Fico has taken a hard stand from the beginning, echoing far-right Polish leader Jaroslaw Kaczyński, Viktor Orbán and Czech President Miloš Zeman in an openly Islamophobic campaign against both the refugees and the EU’s attempt to redistribute the refugees. Although the leader of a (nominally) center-left party, Direction-Social Democracy (SMER-SD), Fico has a history of nationalist statements, mostly against Roma (so-called “Gypsies”), which have landed him in trouble with his European allies in the Progressive Alliance of Socialists and Democrats (S&D). Despite threats from S&D to censure him and his party, Fico doubled down by making various Islamophobic statements and threatening to take the EU to court over its refugee plan. He even went so far as to say that he wanted to put every Muslim in Slovakia under surveillance! Slovak Prime Minister Robert Fico, who railed against the refugees. His appeal to extremist groups in Slovakia failed to secure a majority coalition for him in the Slovak parliament. These days we expect elections in East Central Europe to be bad news for liberal democracy. In 2014 Hungary re-elected its strongman Viktor Orbán, despite the fact that he had transformed his country into an narrow-minded democracy, and in 2015 Poland brought back Law and Justice (PiS), the party of Jaroslaw Kaczyński, who has been praising Viktor Orbán’s “Budapest Model” since 2011. Surprisingly, Fico’s courting of right-wing groups did not help him in the Slovak general elections. Based on the results Smer-SD was the big loser of the election, winning just 28.3 percent of the vote, a loss of 16.1 percent compared to 2012! Clearly this is not because of a lack of support for Fico’s anti-immigration positions within the Slovak population. Even before the refugee crisis hit Europe, Slovaks were among the least positive towards foreign immigration within the EU, and, given the various mass demonstrations during 2015, that situation has not changed for the better. But the demonstrations did not just bring people together to voice opposition to Muslim refugees, they also gave a platform to a variety of far-right activists and groups. The most visible was Marian Kotleba, former leader of Slovak Brotherhood, a neo-Nazi party that was disbanded by the Supreme Court. Kotleba has since bounced back, founding the extreme right People’s Party of Slovakia (ĽSNS), and getting elected governor of the Banská Bystrica Region in 2013. Kotleba and ĽSNS were very active and visible in the anti-immigration demonstrations in Slovakia and were rewarded with 8.0 percent of the vote (an increase of 6.4 percent) in the 2016 national elections. Even more shocking, ĽSNS was the biggest party among first-time voters, attracting a staggering 22.7 percent among 18 to 21 year olds! What then should be our response? In such crises, it is understandable that citizens are concerned about a mass influx of foreigners—especially when it involves hundreds of thousands of men and women of different faiths and cultures. After all, settling refugees in our communities exhausts our own governments’ resources, making it difficult to meet the needs of our own citizens. But we people of faith have a higher calling to resist extremist politics when it is in opposition to immediate human need for compassion. We Christians and Muslims must respond as we believe Jesus and Mohammad (PBUT) would respond, encouraging their followers to assist helpless pilgrims and sojourners. There is a very famous Arabic statement in this regard, “The foreigner is blind even if he has eyes,” which indicates the vulnerability of the stranger and suggests that the stranger needs help and guidance. Shropshire was accompanied to Washington by Suhaib Mallisho of Jeddah, Saudi Arabia. Present at this important meeting were leaders from numerous humanitarian non-government organizations that are already advocating for human rights and world peace in the US capital. Among attendees of the MVPR-sponsored luncheon, were Diane Randall, Friends Committee on National Legislation; Lisa Sams, Middle East Sub-Committee/Global Missions Committee of St. Albans Episcopal Church; Richard Parkins, Friends of the Episcopal Church of South Sudan; Stephanie Kinney, former diplomat with the US Department of State; Thomas Johnson, Companion Diocese of Jerusalem; Nate Hosler, Office of Public Witness, Church of the Brethren; Sayyid Syeed, Islamic Society of North America; Ambassador Warren Clark, Churches for Middle East Peace; and Raed Jarrad, Policy Impact, American Friends Service Committee. Shropshire and Marina Buhler-Miko, acting MVPR chief operations officer, presided over the meeting. “Washington, DC, is an important city. MVPR advocacy has found a lot of friends here,” Shropshire said. 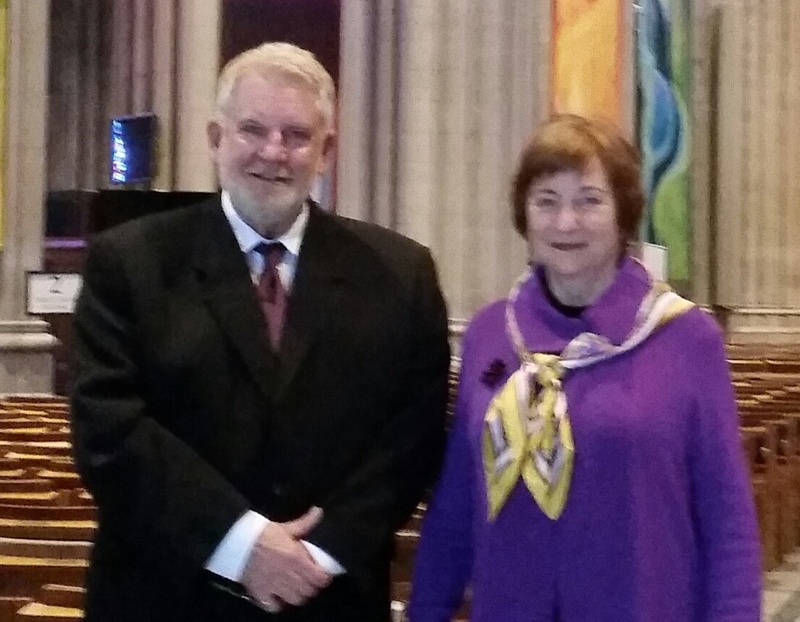 Sam with Marina Buhler-Miko at the Washington National Cathedral. Marina has agreed to serve as MVPR chief operating officer. 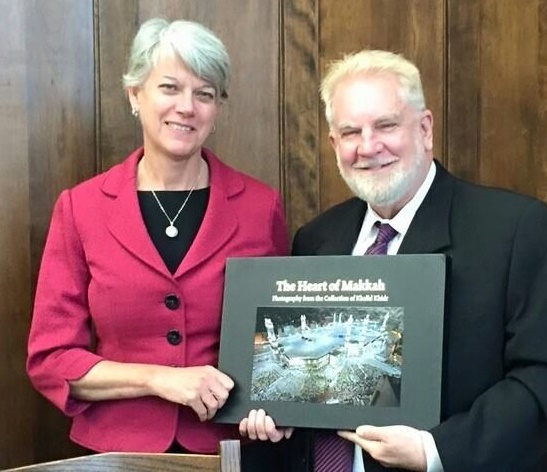 Shropshire also met with Patty Johnson, Canon Missioner for Outreach of the Washington National Cathedral, and Grace Said, Chair of the Cathedral’s Palestine-Israel Advocacy Group. Shropshire said MVPR is seeking to provide leadership in peacemaking and human rights, especially in the Middle East. He emphasized that political and religious reconciliation is of utmost importance since, today, many faiths have been divided and hijacked by radical elements. Shropshire has been living in the Mecca Region of Saudi Arabia for the past three years. He believes that the Abrahamic faiths, working in solidarity, hold the key to solving many of the world’s problems. There are more refugees in the world today as a result of war and repression than at any time since World War II. Throughout history, especially in the Middle East, there have been individuals who have stood up for the rights of others. Shropshire says there is a firm foundation that has been established for all mankind–beginning in the Middle East with Cyrus the Great’s cylinder and the Prophet Mohammad’s Constitution of Medina, followed by the British Magna Carta, the Bill of Rights as enshrined within the United States Constitution, the French Declaration of the Rights of Man and the eventual Geneva Convention that laid the groundwork for the United Nations’ Universal Declaration of Human Rights. 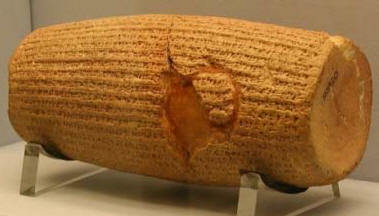 The decrees Cyrus the Grreat made on human rights were inscribed in the Akkadian language on a baked-clay cylinder. It is the first known attempt to innumerate the rights and privileges of peoples. In 539 BC, the armies of Cyrus the Great, the first king of ancient Persia, conquered the city of Babylon. But it was his next actions that marked a major advance for all humankind. He freed the slaves, declared that all people had the right to choose their own religion, and established racial equality. These and other decrees were recorded on a baked-clay cylinder in the Akkadian language with cuneiform script. Known today as the Cyrus Cylinder, this ancient record has now been recognized as the world’s first charter of human rights. It has been translated into all six official languages of the United Nations, and its provisions parallel the first four Articles of the Universal Declaration of Human Rights. From Babylon, the idea of human rights spread quickly to India, Greece and eventually Rome. In Rome the concept of “natural law” arose, in observation of the fact that people tended to follow certain unwritten laws during the course of life, and Roman law was based on rational ideas derived from the nature of things. The Constitution of Medina, also known at the Medina Charter, was created by the Prophet Muhammad (pbuh) in the year 622 CE, it was the first written constitution in the Islamic world. To the surprise of many, another early attempt at formally enumerating human rights is the Charter of Medina, also known as the Constitution of Medina. It was drafted by the Islamic prophet Muhammad (pbuh) shortly after his arrival at Medina in 622 AD, following the Hijra (immigration of Muslims) from Mecca to Medina. The charter constituted an agreement between the various native Muslims of Medina (the Ansar), the Muslim immigrants from Mecca (the Muhajarun), Jewish believers, Christian groups in Medina and even pagans, declaring them to constitute ummah wāḥidah (“one nation”). The Constitution formed the basis of a multi-religious Islamic state in Medina. 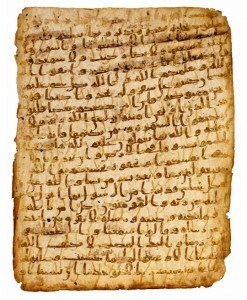 The Constitution of Medina serves as an example of finding resolve in a dispute where peace and pluralism were achieved, not through military successes or ulterior motives, but rather through an agreed upon mutual respect, acceptance, and denunciation of war – aspects that reflect some of the basic tenets of the Prophet Muhammad’s (pbuh) own faith and commitment to God. These guiding principles of early Islam brought peace and stability to Medina. Religious pluralism and friendship and mutual respect were the law of the land! A careful study of this document could help avoid many of the divisions and misunderstandings plaguing the world today. The principles embodied in the Constitution of Medina could easily be used to unite Muslims, Christians, Jews and peoples of other faiths. Islam’s early contribution to human rights is best appreciated when viewed against the backdrop of world history as well as the realities of modern times. As in all times, greed, prejudice and hate drive nations to war and conflict. Economic and social disparities have resulted in the oppression of poorer populations; racial prejudices have been the cause of subjugation and enslavement of people with darker skin; women have been weighed down by chauvinistic attitudes, and pervasive attitudes of religious superiority have led to widespread persecution of people with different beliefs. “Just as Western societies still fight against racism and discrimination, many Muslim societies continue to struggle to fully implement human rights as outlined in Islam,” he says. Magna Carta is one of the most celebrated documents in history. This document was signed in June 1215 by the barons of medieval England and King John. Magna Carta, meaning ‘The Great Charter’, is one of the most famous documents in the world. Originally issued by King John of England (r.1199-1216) as a practical solution to the political crisis he faced in 1215, Magna Carta established for the first time the principle that everybody, including the king, was subject to the law. Although nearly a third of the text was deleted or substantially rewritten within ten years, and almost all the clauses have been repealed in modern times, Magna Carta remains a cornerstone of the British constitution. 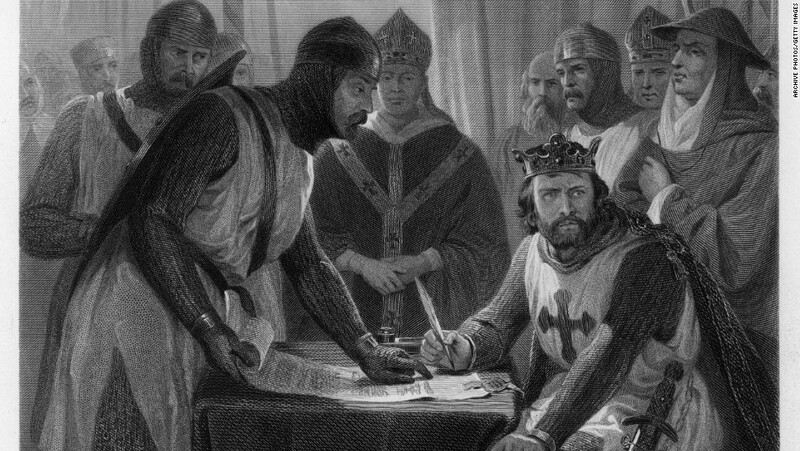 Most of the 63 clauses granted by King John dealt with specific grievances relating to his rule. However, buried within them were a number of fundamental values that both challenged the autocracy of the king and proved highly adaptable in future centuries. Most famously, the 39th clause gave all ‘free men’ the right to justice and a fair trial. Some of the Magna Carta’s core principles were written into in the United States constitution in the form of the Bill of Rights and in many other constitutional documents around the world, as well as later in the Universal Declaration of Human Rights and the European Convention on Human Rights. 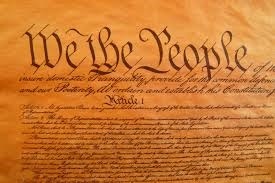 The United States Constitution with its Bill of Rights was ratified in 1787. It is the oldest constitution still in use. The American democracy and its constitution is a foundation stone for a long tradition of human rights and personal freedoms. Written during the summer of 1787 in Philadelphia, the Constitution of the United States of America is the fundamental law of the US federal system of government and a landmark document of the Western world. It is the oldest written national constitution still in use and defines the principal organs of the US government, describing the balance of powers of the legislative government (President, Congress and the Supreme Court), outlining their jurisdictions and the basic rights of American citizens. The early establishment of American human rights laws was in no way perfect as slavery and discrimination against African Americans, Native Americans and other minorities would persist for decades, but the US Constitution would lay the groundwork for an evolving, more humane nation. The Bill of Rights were incorporated as an important part of the US Constitution, protecting the basic freedoms of all American citizens. These human rights came into effect on December 15, 1791, limiting the powers of the federal government of the United States and protecting the rights of all citizens, residents and visitors within American territory. The Bill of Rights protects freedom of speech, freedom of religion, outlines the right to keep and bear arms, the freedom of assembly and the freedom to petition the government. It also prohibits unreasonable search and seizure on private premises. “Cruel and unusual punishment” was strictly forbidden, and it outlawed compelled self-incrimination. The Bill of Rights prohibits the government from making any law “respecting an establishment of religion” and prohibits the federal government “from depriving any person of life, liberty or property” without due process of law. In federal criminal cases it requires indictment by a grand jury for any capital offense, or infamous crime, guarantees a speedy public trial with an impartial jury in the district in which the crime occurred and prohibits double jeopardy. 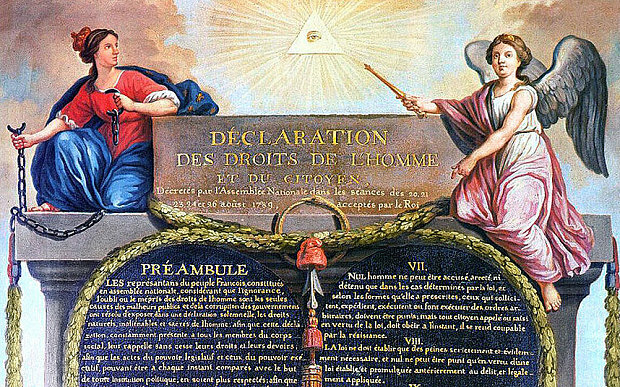 The Declaration of the Rights of Man and of the Citizen of 1789, is a major human rights document resulting from the French Revolution. The inspiration and content of this document emerged largely from the ideals of the American Revolution. The key drafts were prepared by the Marquis de Lafayette, working at times with his close friend Thomas Jefferson. In August 1789, Honoré Mirabeau played a central role in conceptualizing and drafting the Declaration of the Rights of Man and of the Citizen. The last article of the Declaration of the Rights of Man and the Citizen was adopted on 26 August 1789 by the National Constituent Assembly, towards the end of the French Revolution. It was the first step toward writing a constitution for France. Inspired by the Enlightenment, the original version of the declaration was discussed by the representatives on the basis of a 24 article draft. The draft was later modified during the debates. A second and lengthier declaration, known as the Declaration of the Rights of Man and Citizen of 1793, was written in 1793 but never formally adopted. 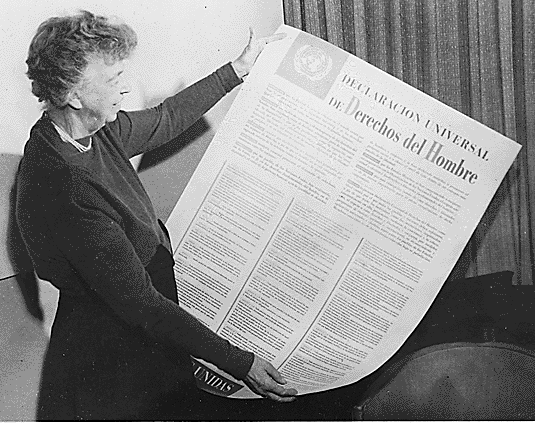 Eleanor Roosevelt reviews the Spanish version of the Universal Declaration of Human Rights. With the end of World War II and the creation of the United Nations, the international community vowed never again to allow atrocities like those of that international conflict to ever happen again. World leaders decided to complement the UN Charter with a road map to guarantee the rights of all peoples. The document they considered, and which would later become known as the Universal Declaration of Human Rights, was taken up at the first session of the General Assembly in 1946. The Assembly reviewed this draft Declaration on Fundamental Human Rights and Freedoms and transmitted it to the Economic and Social Council “for reference to the Commission on Human Rights for consideration. The Commission, at its first session early in 1947, authorized its members to formulate what it termed “a preliminary draft International Bill of Human Rights”. Later the work was taken over by a formal drafting committee, consisting of members of the Commission from eight States, selected with due regard for geographical distribution. The Commission on Human Rights was made up of 18 members from various political, cultural and religious backgrounds. Eleanor Roosevelt, widow of American President Franklin D. Roosevelt, chaired the Universal Declaration of Human Rights drafting committee. With her were René Cassin of France, who composed the first draft of the Declaration, the Committee Rapporteur Charles Malik of Lebanon, Vice Chairman Peng Chung Chang of China, and John Humphrey of Canada, director of the UN’s Human Rights Division and preparer of the declaration’s blueprint. Eleanor Roosevelt was recognized as the driving force behind the declaration’s eventual adoption. The final draft, presented by Cassin, was handed to the UN Commission on Human Rights in 1947, which was being held in Geneva. The entire text of the Universal Declaration of Human Rights was composed in less than two years. At a time when the world was divided into Eastern and Western blocks, finding a common ground on several points proved to be a colossal task. Many other men and women have stood up at various times, against all odds, to champion world peace and human rights. And, today, 21st century activists are answering the call. Who knew heavy metal could promote peace? But that’s just what’s happening as the Israeli band, Orphaned Land, and the Palestinian band, Khalas, have toured Britain. They come from different countries. They even write different kinds of lyrics. But they have shown how art has an ability to transcend lines that politics often can’t. We’re constantly bombarded by implicit and explicit images of the relationship that Jews and Muslims supposedly have in today’s world. We are bombarded with the cliched reminder that we “used to get along” but recently have become enemies. We’ve almost become used to it, accepted it as some sort of reality. And, ironically, all these “interfaith” events can often cause us to feel even more disconnected. They just don’t seem as genuine as a true connection. It would seem the only people you would need to show such “unity” with is people you don’t get along with. Which is why we need to look deeper. We need to look wider. We need to see that “unity” doesn’t mean press. It doesn’t mean “shows of support”. It means genuine connection and giving. And the truth is that the world is scattered with that. The truth is that the press likes to say just one side of the story, likes to focus on conflict. But there is unity. There is connection. All we need to do is look! More than 2 million Rohingya men, women and children have fled the ethnic cleansing of the Myanmar military government. Few know or care about this modern-day holocaust. It was through my close friend Shafik Zubir, the mu’adhin (“caller to prayer”) at Taqwa Mosque in Jeddah, Saudi Arabia, that I gained a strong interest in the fate of the millions of Rohingya Muslims of Myanmar (formerly Burma). Shafik’s parents immigrated from Myanmar to Saudi Arabia in 1985. Shafik and his family have shared with me the plight of Myanmar’s Muslims. Now I find myself travelling to Myanmar to personally investigate the horrific genocide that has been committed against these noble people during the past century. 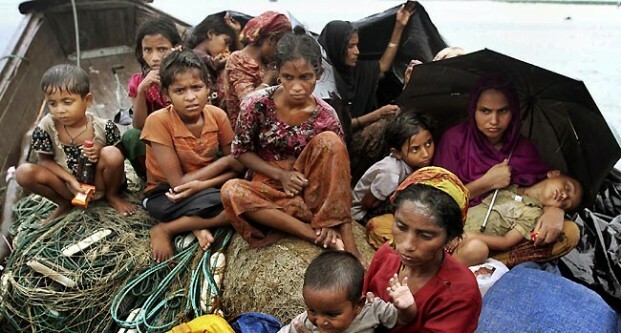 Approximately 1.5 millions Rohingya men, women and children remain in Myanmar. More than 2 million Rohingyas have fled to Bangladesh, Thailand and Malaysia, on foot or by boat, and from there have sought refuge in other nations. The death toll of those fleeing this modern-day holocaust is unknown, but it is, no doubt, in the hundreds of thousands. Greater than 300 thousand Rohingyas now reside in the Kingdom of Saudi Arabia. It has been my privilege to meet and speak with many of them. Myanmar was ruled with an iron fist long before the current regime came to power. From the early 19th century until World War II, the insatiable machine that was the British Empire held sway over Burma. Before the British, there were the kings of old, who rose to power by eliminating rivals with claims to the throne. Tracing the conflicts back to the 9th century, we find the Himalayan Bamar people, who comprise two-thirds of the population, at war with the Tibetan Plateau’s Mon people. The fight went on for so long that by the time the Bamar came out on top, the two cultures had effectively merged. The 11th-century Bamar king Anawrahta converted the land to Theravada Buddhism, and inaugurated what many consider to be its golden age. He used his war spoils to build the first temples at Bagan (Pagan). Stupa after stupa sprouted under successive kings, but the vast money and effort poured into their construction weakened the kingdom. Kublai Khan and his Mongol hordes swept through Bagan in 1287, hastening Myanmar’s decline into the dark ages. 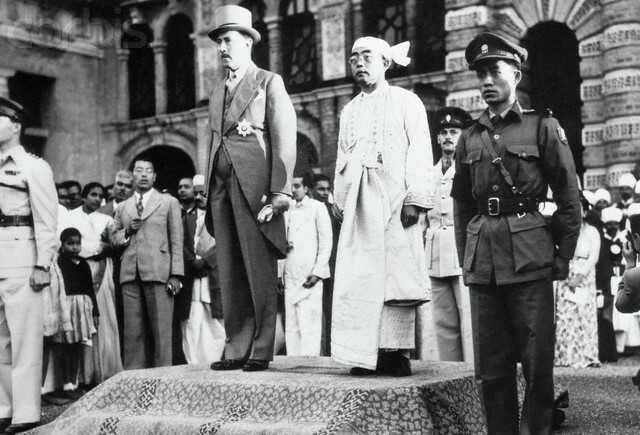 The British governor, left, and Burma’s first president, Sao Shwe Thaik, stand at attention as the new nation’s flag is raised on January 4, 1948. There’s not much known about the centuries that followed. History picks up again with the arrival of the Europeans – first the Portuguese, in the 16th century, and then the British, who had already colonised India and were looking for more territory in the East. In three moves (1824, 1852 and 1885), the British took over all of Myanmar. The Burmese king and queen were exiled to India and their grand palace at Mandalay was looted and used as a barracks to quarter British and Indian troops. The colonial era wrought great changes in Myanmar’s demographics and infrastructure. Large numbers of Indians were brought in to work as civil servants, and Chinese were encouraged to immigrate and stimulate trade. The British built railways and ports, and many British companies grew wealthy trading in teak and rice. Many Burmese were unhappy with the colonial status quo. A nationalist movement developed, and there were demonstrations, often led, in true Burmese fashion, by Buddhist monks. Two famous nationalist monks, U Ottama and U Wizaya, died in a British prison and are revered to this day. During World War II, the Japanese, linked with the Burmese Independence Army (BIA), drove the British out of Myanmar and declared it an independent country. But the Japanese were able to maintain Burmese political support for only a short time before their harsh and arrogant conduct alienated the Burmese people. Towards the end of the war, the Burmese switched sides and fought with the Allies to drive out the Japanese. Bogyoke Aung San emerged from the haze of war as the country’s natural leader. An early activist for nationalism, then defence minister in the Burma National Army, Aung San was the man to hold the country together through the transition to independence. When elections were held in 1947, Aung San’s party won an overwhelming majority. But before he could take office, he was assassinated by a rival, along with most of his cabinet. Independence followed in 1948, with Aung San’s protégé U Nu at the helm. Ethnic conflicts raged and chaos ensued. Since 1962, when the Ne Win government seized power in a military coup, Myanmar has been under the vice like grip of successive regimes that have ruled the country through oppression and fear. In 1962 General Ne Win led a left-wing army takeover and set the country on the ‘Burmese Way to Socialism’. He nationalised everything, including retail shops, and quickly crippled the country’s economy. By 1987 it had reached a virtual standstill, and the long-suffering Burmese people decided they’d had enough of their incompetent government. By 1987 it had reached a virtual standstill, and the long-suffering Burmese people decided they’d had enough of their incompetent government. In early 1988, they packed the streets and there were massive confrontations between pro-democracy demonstrators and the military that resulted in an estimated 3000 deaths over a six-week period. Once again, monks were at the helm. They turned their alms bowls upside down (the Buddhist symbol of condemnation) and insisted that Ne Win had to go. He finally did, in July 1988, but he retained a vestige of his old dictatorial power from behind the scenes. 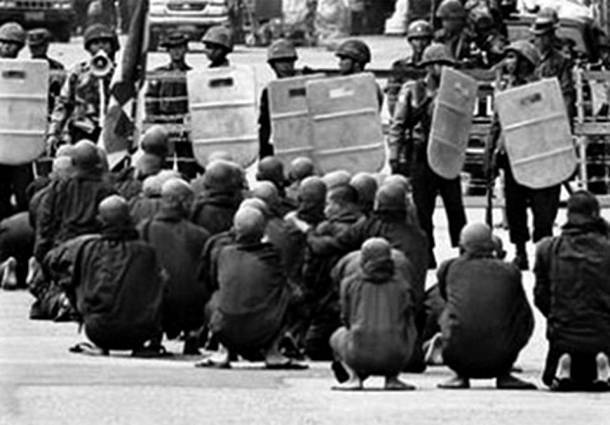 The shaken government quickly formed the Orwellian-sounding SLORC (State Law and Order Restoration Council), declared martial law and promised to hold democratic elections in May 1989. The opposition, led by Bogyoke Aung San’s charismatic daughter, Aung San Suu Kyi, organised an opposition party, the National League for Democracy (NLD). Around the same time, Slorc changed the country’s official name from the Union of Burma to the Union of Myanmar, claiming ‘Burma’ was a vestige of European colonialism. While the Burmese population rallied around the NLD, the SLORC grew increasingly nervous. It placed Aung San Suu Kyi under house arrest and postponed the election. In spite of this and other dirty tactics, the NLD won more than 85% of the vote. Sore losers, Slorc refused to allow the NLD to assume its parliamentary seats and arrested most of the party leadership. Burma’s pro-democracy leader Aung San Suu Kyi addresses her supporters from her house compound after her release from house arrest. Aung San Suu Kyi was awarded the Nobel Peace Prize in 1991 and was finally released from house arrest in July 1995. She was arrested again in 2000 and held in her home until the UN brokered her unconditional release in May 2002. 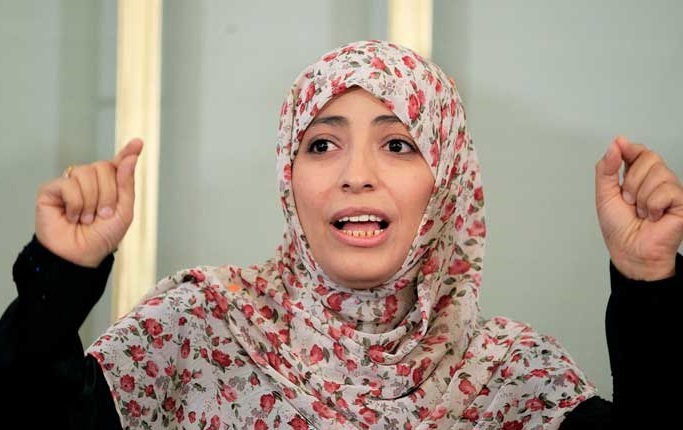 She was rearrested in May 2003 and released in November 2010 by the military authorities. During her arrest, Aung San Suu Kyi continually refused offers of freedom in exchange for exile from the country and, despite an ongoing debate in the pro-democracy movement over future strategy, her stature throughout Myanmar remained strong. In moves symbolic of the positive momentum in the country, in 2011 Suu Kyi left Yangon for the first time in eight years, and in May 2012 Suu Kyi entered the lower house of the Burmese parliament as an MP. Much more remains to be done, but the hope is that decades of isolation may be coming to an end. However after nearly 50 years of military rule, the apparatus of the state is entrenched in the fabric of Burmese society and as the pogrom continues in Arakan state, the back story provides unnerving evidence that systematic official behavior has lead to the current crisis. 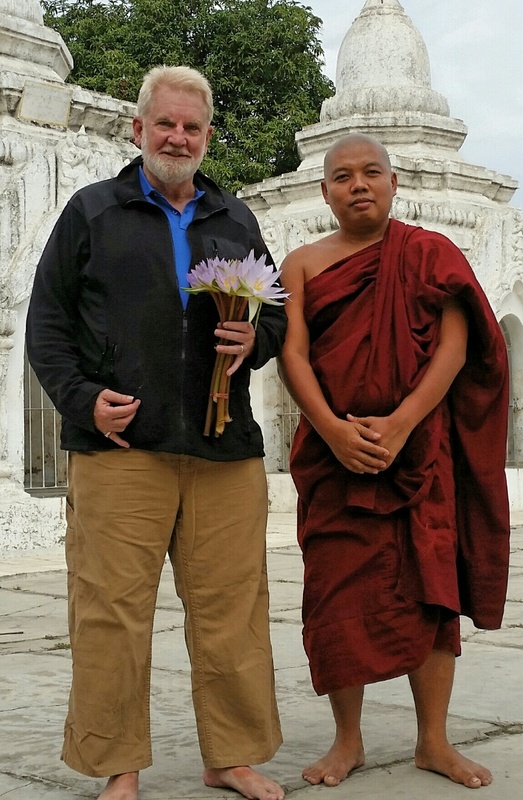 What has occurred in western Burma has been described as a sectarian conflict between two communities who simply hate each other. This prognosis is demonstrably false, and a look at the situation in Arakan provides ample evidence that there is a systematic pattern, which in most cases would amount to crimes against humanity. One element of this picture is the improbability of a “sectarian conflict.” Arakan (Rakhine) state has a population of almost 4 million, making the Muslim or Rohingya population less than quarter of the inhabitants, thus making a two-sided conflict highly illogical. Further, the minority population has been controlled by the state to the extent that they are unable to travel between towns, renovate a mosque or even have a child or marry without a permit from the military. The control of this population has long been perpetuated not just by uniformed military or Nasaka (border guard) personnel but also by quasi-civilian militias, as has been the case in much of the country. Indeed in Burma the ruling party, the Union Solidarity and Development Party (USDP) grew out of the Union Solidarity and Development Association (USDA). 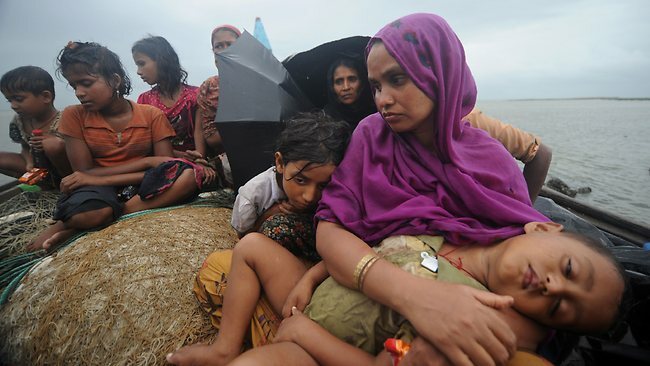 A Rohingya mother holds her child close as she flees persecution by boat. This organisation had perhaps its most notorious hour in 2003, when it attacked Aung San Suu Kyi’s convoy in central Burma. The authorities naturally tried to portray it as a clash between two rival political groups. However, only one side, the National League for Democracy (NLD), suffered 70 deaths and only one side’s supporters were arrested – also the NLD. Muslims and human rights organizations around the world decry the genocide being committed against the Rohingya peoples. Given the uncanny resemblance of this case and the details surrounding late May’s ‘spark incident’, one must ask questions about the current government and the legitimacy of the reform process. Khin Nyunt was not only adept at preventing anti-government actions, he was also good at neutralising ethnic insurgent groups and casually referred to the entire nation of India as “kalars” – a pejorative term used in Burma to describe Muslims and individuals of South Asian descent. 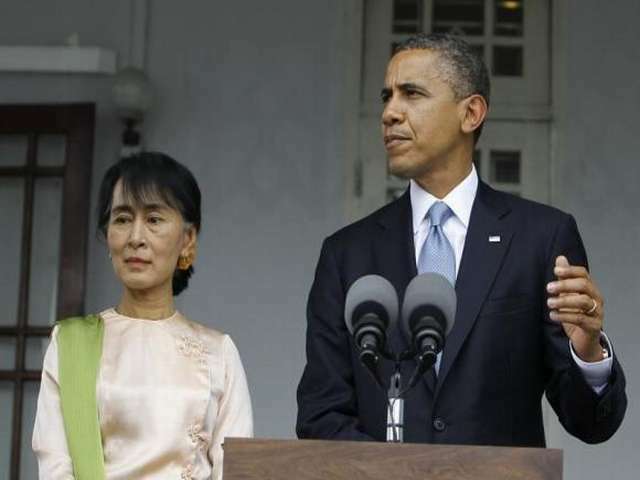 In November 2014 US President Barack Obama called on Myanmar to end discrimination against Rohingya people, urging in his strongest comments on the persecuted Muslim minority that the government grant them equal rights. Needless to say, however, despite this and the accumulated evidence, the US government has lifted punitive measures against the Myanmar government. The lack of civil rights is overshadowed, moreover, by the basic human indicators that have been thrust on the population by the government, as the US embassy noted: “Infant mortality is four times the national average (71 per 1000 births); 64% of children under five are chronically malnourished, and stunted growth is common.” Infant mortality then is roughly equivalent to that of Ethiopia, which is chronically affected by drought, and 80% of the population is illiterate with one teacher for every 79 students. If this were not systematic, the discrepancies with other regions of the country would not be so severe. The government has been more than able to prevent freedom of movement for the roughly 850,000 Rohingya still in existence in the area, it would then seem that with one of the largest armed forces in Asia controlling the movement of mobs would be easy. Given that Thein Sein has attempted to off load the entire population onto the UNHCR, it is evident that he too is in favour of removing the population. 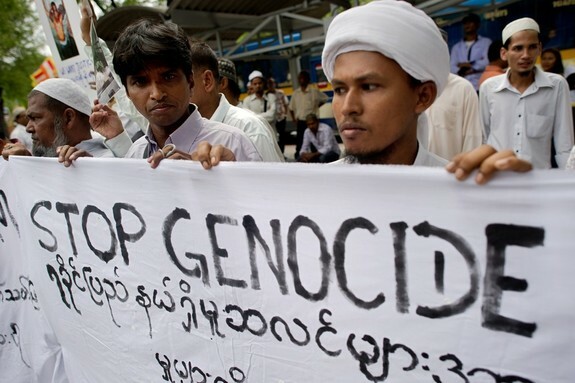 With the well-documented government abuses against the population, there is not much of a case to suggest that what is occurring now in Arakan state is anything less than genocide. Bangladesh–my first impression: So many people on so little land! It is like crowding half the US populations into a land mass the size of New York state. The early history of the Bengal region featured a succession of vast Indian empires, often accompanied by internal strife, and a struggle between Hinduism and Buddhism for dominance. Islam later made its appearance during the 8th century when Sufi missionaries arrived on the scene. Later, Muslim rulers paved the way for millions of new converts by building mosques, schools and social centers. 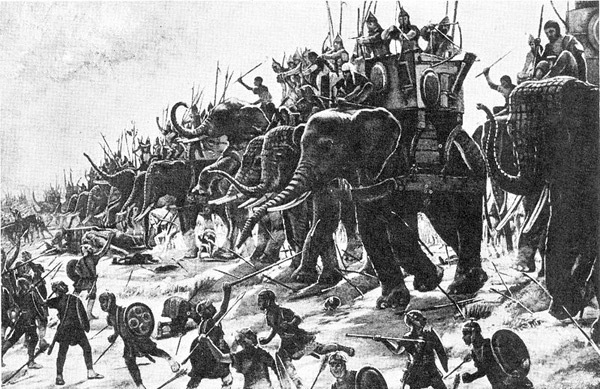 The first European power to arrive in India was the Macedonian army of Alexander the Great in 327–326 BC. Alexander appointed regional leaders in the northwest of India to govern in his absence, but his influence quickly crumbled after his armies were ousted from the Subcontinent. Later, trade between the various Indian states was established between the Roman Empire and India by Roman sailors who had reached India via the Red Sea and Arabian Sea, but the Romans never established permanent trading settlements. The spice trade between India and Europe was one of the main avenues of trade in the world economy and was the main catalyst for the period of European exploration. Indeed, the search for a shorter, quicker access to India led to the accidental “discovery” of the Americas by Christopher Columbus in 1492. 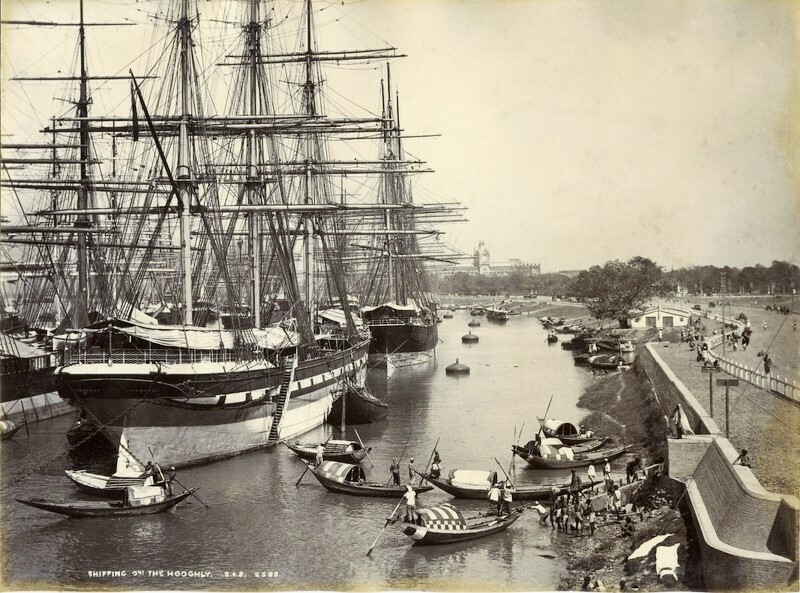 British East India Company ships at dock in Calcutta, India. The ships carried spices, silk to Europe and Christian missionaries and missionaries to Asia. Only a few years later, near the end of the 15th century, Portuguese sailor Vasco da Gama became the first European to re-establish direct trade links with India since those of Roman times by being the first to arrive by circumnavigating Africa (1497–1499). Having arrived in Calicut, which by then was one of the major trading ports of the eastern world, he obtained permission to trade in the city from Saamoothiri Rajah. Trading rivalries among the seafaring European powers brought other European powers to India. The Dutch, England, France, and Denmark all established trading posts in India in the early 17th century. As the Mughal Empire disintegrated in the early 18th century, and then as the Maratha Empire became weakened after the third battle of Panipat, many relatively weak and unstable Indian states which emerged were increasingly open to manipulation by the Europeans, through dependent Indian rulers. In the later 18th century Great Britain and France struggled for dominance, partly through proxy Indian rulers but also by direct military intervention. The defeat of the redoubtable Indian ruler Tipu Sultan in 1799 marginalized the French influence. This was followed by a rapid expansion of British power through the greater part of the Indian subcontinent in the early 19th century. By the middle of the century the British had already gained direct or indirect control over almost all of India. British India, consisting of the directly-ruled British presidencies and provinces, contained the most populous and valuable parts of the British Empire and thus became known as “the jewel in the British crown”. A series of deadly famines were to hit the Bengal region of India–the last and most devastating was in 1941. It struck hard, killing more than 10 million men, women and children. True, Britain was preoccupied with its own national survival during World War II, but Prime Minister Winston Churchill’s callous response to the suffering of the Bengali peoples was shocking. British imperialism had long justified itself with the pretense that the colonization of India was conducted for the benefit of the governed. However in his recently published book The Ugly Britain, Shashi Tharoor disagrees. He documents disparaging remarks that seemed to be foundational to the thinking of British economists and politicians throughout the colonial period. 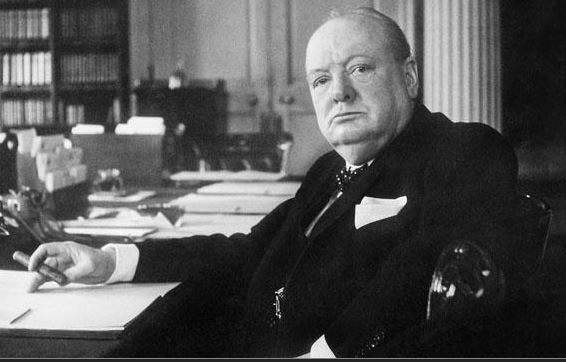 In doing so, Tharoor dampens our western idolatry of the late Winston Churchill. He says Churchill’s conduct in the summer and fall of 1943, during the peak of the last great Bengal famine, revealed the man’s true character. Pedicabs have replaced the man-drawn rickshaws during the past century. Pedicabs serve as a main means of transportation for most of the 15 million inhabitants in the sprawling capital city Dhaka. The borders of the modern People’s Republic of Bangladesh were established with the partition of Bengal and India in August 1947, when the region became East Pakistan as a part of the newly formed State of Pakistan. However, it was separated from West Pakistan by 1,600 km (994 mi) of Indian territory. Due to political exclusion, ethnic and linguistic discrimination, as well as economic neglect by the politically dominant West Pakistan, popular agitation and civil disobedience eventually led to the war of independence in 1971 and the founding of the People’s Republic of Bangladesh. After gaining independence, the new state would continue to endure food shortages and widespread poverty, as well as political turmoil and military coups. The restoration of democracy in 1991 has been followed by relative political calm and slow economic progress; however, a third of this poor country annually floods during the monsoon rainy season, hampering economic development. 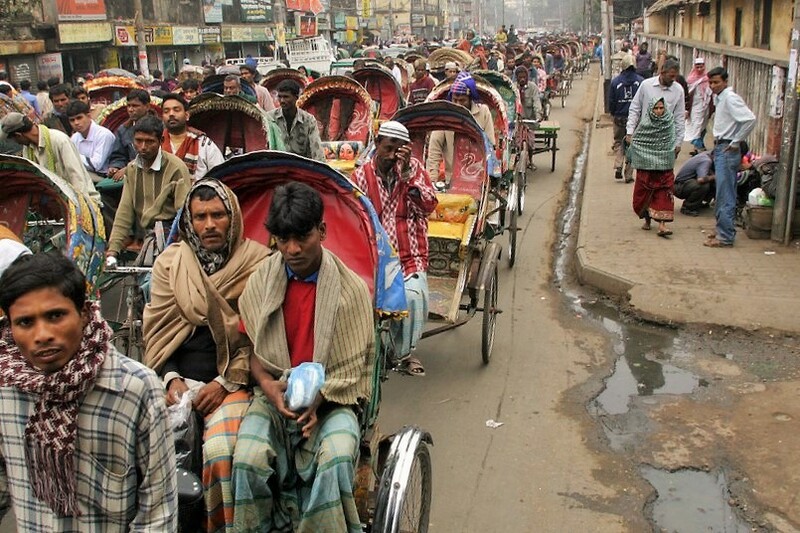 The population of Bangladesh is 142 million. That’s almost half the US population crowded into a land mass about the size of New York state. Dr Rashid Malik (center) with his brothers and sister. 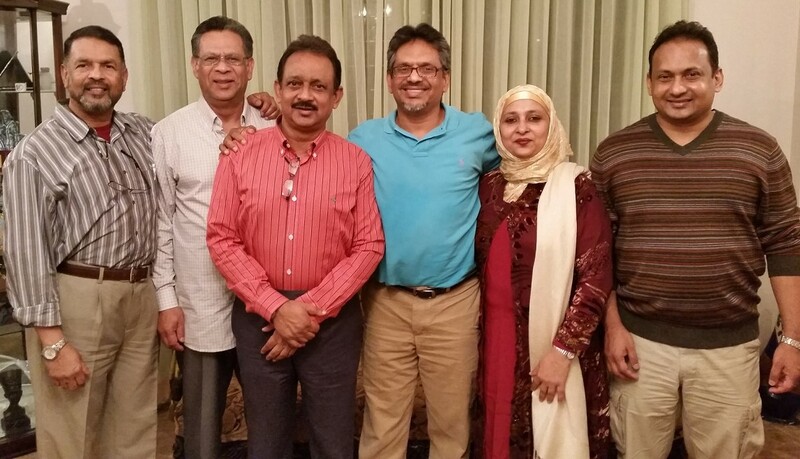 I am welcomed to Bangladesh by my Bangladeshi friend Dr. Rashid Malik and his wife Yasmin Malik, founders of Malik College in Atlanta, Georgia. This was my first visit to Bangladesh, so it was reassuring to be met by someone who was very familiar with this relatively new nation and its political goings on. Rashid’s older brother Malik Abdullah Al-Amin (“Sadi”) is a judge in the Bangladesh Judicial Service. Sadi, his parents and the rest of Rashid’s family have played an important role in the formation of this relatively new nation. Rashid’s father, Advocate Abdul Wadood Malik, was a lawyer for the Supreme Court of Pakistan and continued in that position in the Bangladesh Supreme Court after Bangladesh won its independence from Pakistan . His mother Momtaz Begum Malik is the former principal of a prestigious college in Bangladesh. Today members of Malik family can be found in various parts of the world: the US, Sweden, India, Kuwait, and the United Kingdom. 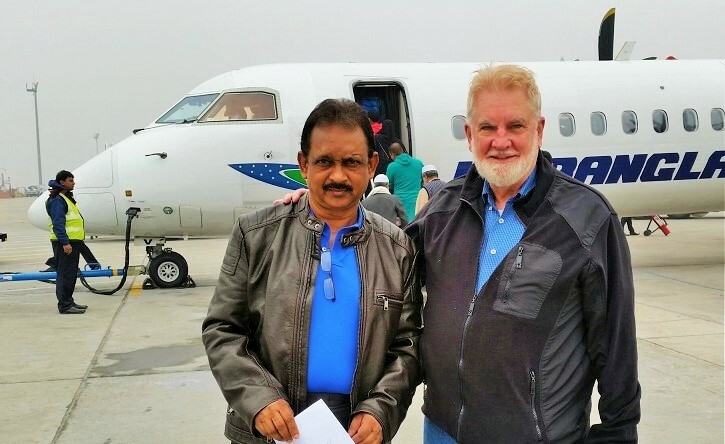 Judge Sadi Malik and Sam prepare to board a flight to far-south Bangladesh. Knowing of my interest in learning more about the history and persecution of Rohingya Muslims within the neighboring state Myanmar (formerly Burma), Judge Malik arranged flight tickets for Rashid, himself and me to travel south to Cox’s Bazar, on the Gulf of Bengal. In Cox’s Basar we were met by a private car and driver and taken south. From Cox’s Bazar south are huge populations of Rohingya refugees who have fled persecution in neighboring Myanmar. A history of the Rohingya peoples and the cause of the appalling persecution will be discussed in detail in my next blog post about my travels to Myanmar and Thailand. Here we will address the issue of Rohingya refugees living in Bangladesh. 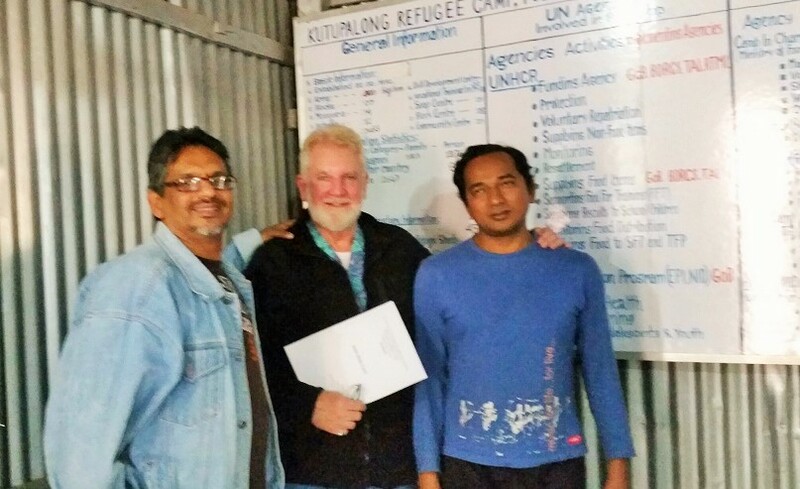 Dr. Rashid Malik, Sam and UNHCR Kutupalong camp director Mohammed Ishmael. arriving as refugees in Bangladesh, these desperately poor people are more dependent on aid than ever. While these may sound like luxuries to an estimated 240,000 other unregistered Rohingyas living outside the camps and in the hills and local villagers in this poverty-stricken region, camp residents often lament the fact that their entire lives appear to be doomed to be living out as unsettled refugees. There are mixed reactions to the official refugee camps. The UN refugee agency is working to change that sense of powerlessness, but within tight operational constraints. It works closely with refugee-elected camp management committees, empowering them to mediate disputes and organizing women’s training and peace education workshops. 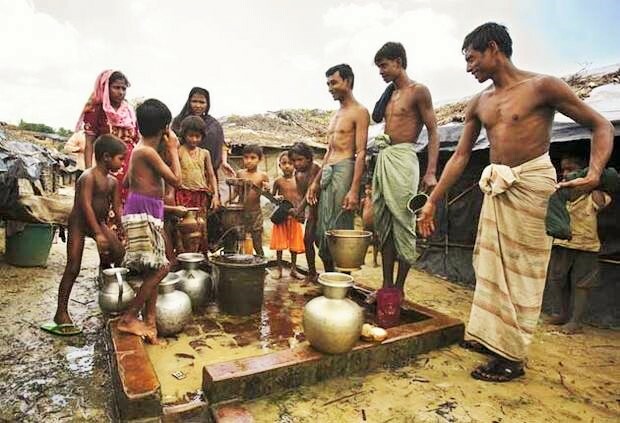 Rohingya men and women retrieve water from a Kutupalong camp well. Refugees are also encouraged to participate in the day-to-day running of the camps. Bibi Begum, 30, helps to distribute food rations in Kutupalong every two weeks. Today she is in charge of sugar, stirring a sack sugar with her hand to loosen the grains before spooning precise portions into waiting plastic bags. A widow with three children, she is one of seven incentive workers at the food distribution center who are given employment. The UNHCR vocational training is another important empowerment tool. While the refugees are not permitted to work or to sell things they produce, UNHCR seeks to keep them occupied while teaching them skills like carpentry, soap making and tailoring that they can hopefully use in the future. Sam is greeted by children of the Kutupalong refugee camp. When completed, Hamida’s soaps are taken to the Bangladeshi Red Crescent Society to be distributed in the camp’s Women’s Centre along with some underwear, clothing and other personal items. The clothing items are made at the Nayapara Women’s Centre by refugees attending the tailoring class. “They are usually aged 15 to 25, and rotate every six months,” said one of the women in charge. “We teach them skills and keep them busy so hopefully they don’t get married off at a young age. 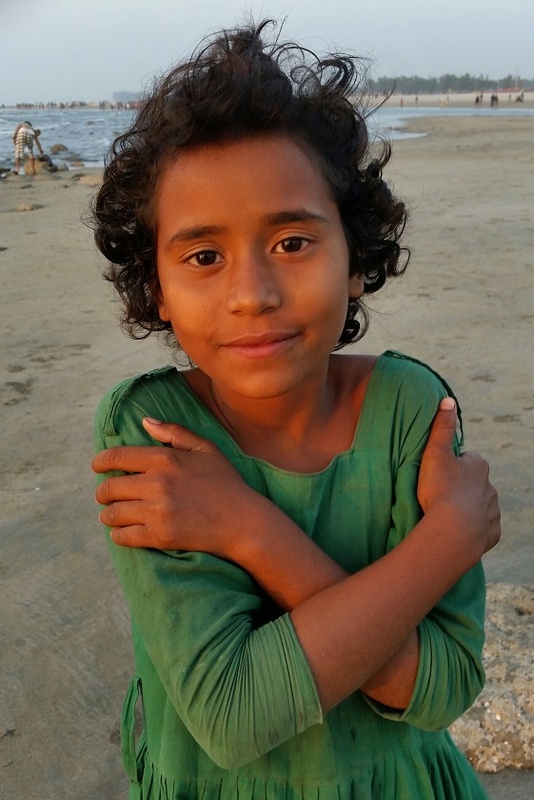 Looking for ways to make money, a lone Rohingya girl, 11, mingles with tourists on a beach. Unfortunately, there are few prospects after the six-month training as most refugees cannot afford to buy their own equipment. Even those who manage to buy a sewing machine find it hard to get raw materials and to market their products. Without regular practice, their skills fade quickly. In comparison, the more than 240,000 unregistered Rohingyas living outside the camps appear to have developed their own coping mechanisms over the years. I am shocked at the sight of thousands of young children, 8 to 10 years old, wandering the roads or working in the markets, many without parents. The roadside markets are busy and these children have found informal ways to survive without government or UNHCR support. I am told that many have resorted to “sordid ways” of subsistence. I inquire further. It is said some of these Rohingya children are falling prey to human trafficking and heroin trade. Many of these Rohingya children have little or no knowledge of the Islamic faith that once guided them morally. These problem lead one to believe that we need rethink how best to help these stranded refugees. 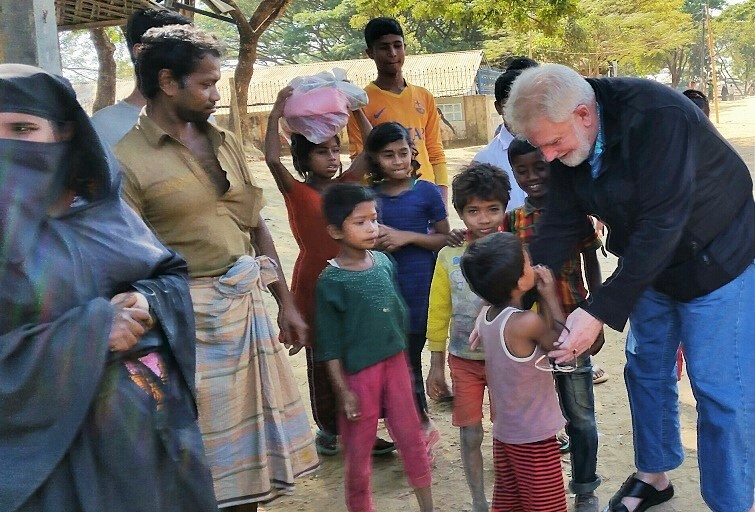 He added that the international community should work with the Bangladeshi government to shift from focusing on just the two camps—which currently cares for only 10 to 15 per cent of the refugee population. He says the whole refugee population, including those outside the camps, must be immediately assisted if practical solutions are to be found to this long-running catastrophe. Young children 9 to 15 years of age are seen wandering the streets. We learn that many of their mothers and fathers were killed in Myanmar or have died from disease and starvation during their exodus en route to Bangladesh. In the following 5-minute video you will hear testimonies about the nearly 300,000 Rohingya refugees now living in Bangladesh. One single bomb named “Little Boy” leveled the big city of Hiroshima. Today’s nuclear weapons are each thousands of times more powerful. By 2013 there were more than 4,100 active nuclear warheads in the world’s arsenal–enough to destroy all of mankind. Another 17,300 nuclear warheads are on standby. On August 6, 1945, 8:15 AM, after 44 months of increasingly brutal fighting in the Pacific, the Enola Gay, an American B-29 bomber loaded with a devastating new weapon, appeared in the sky over Hiroshima, Japan. Minutes later, that new weapon—a bomb that released its enormous destructive energy by splitting uranium atoms to create a chain reaction—detonated in the sky, killing some 70,000 Japanese civilians instantly and leveling the city. 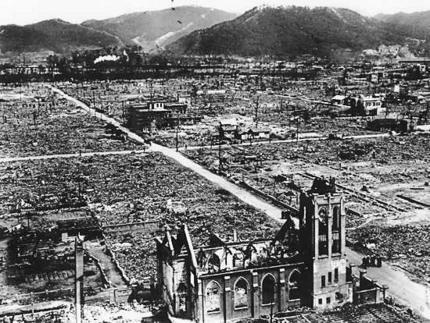 Three days later, the U.S. dropped a second atomic bomb over the city of Nagasaki, with similarly devastating results. The following week, Japan’s emperor addressed his country over the radio to announce the decision to surrender. World War II had finally come to its dramatic conclusion. In 1997 my Project Friendship Russian exchange student Timur Chirikov was a senior at Severn School in Severna Park, Maryland. Timur brought home a homework assignment. He had been asked to write a term paper on the atomic bombings of Hiroshima and Nagasaki. Like most Americans, I had never really given much thought to the subject. I agreed to help Timur with this project. We began to pour through all kinds of information we found on the internet or in print at our local library. Timur had to first decide a “pro” or “con” position regarding the US use of atomic weapons to end the war with Japan. After looking through hundreds of pages of information, he decided he would write against the use of the atomic weapons. The clincher in that decision seemed to be the Oppenheimer Target Committee report that had been declassified by the US Department of Defense. 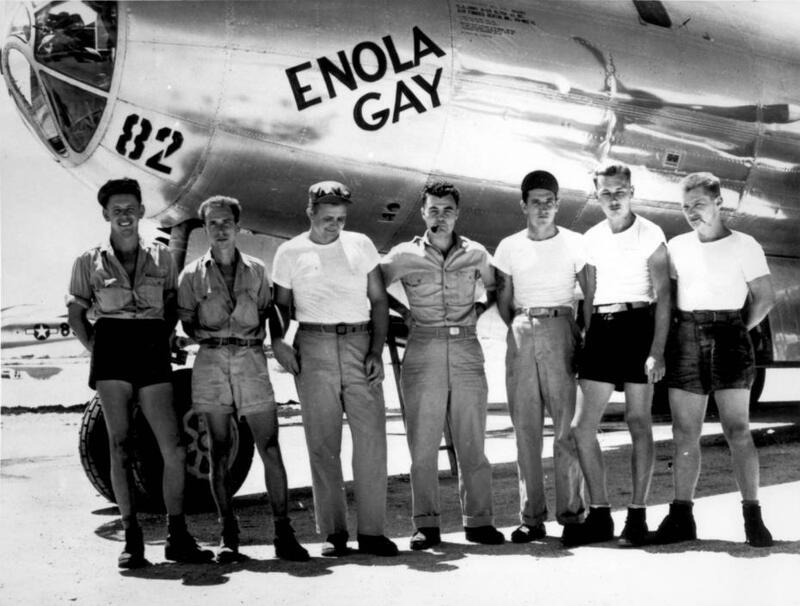 The Enola Gay crew photographed the mushroom cloud over Hiroshima. The photos on the right show the city of Hiroshima before and after the blast. Timur and I read those words in disbelief. What? More educated, intelligent people can better appreciate being incinerated by an atomic bomb? Hiroshima was the last major Japanese city left untouched. It was the political and economic heart of the Chugoku Region and possessed vital military base. The population at the time was in excess of 350,000. Hiroshima would be “number one” on the Target Committee’s report. The decision to employ atomic weapons against Japan remains a contentious chapter in American history. Even before President Harry S. Truman finalized his decision to use the bombs, members of Truman’s inner circle grappled with the specifics of the decision to drop the new weapon. Their concerns revolved around a cluster of related issues: whether the use of the technology was necessary to defeat an already crippled Japan; whether a similar outcome could be effected without using the bomb against civilian targets; whether the detonation of a second bomb days after the first, before Japan had time to formulate its response, was justified; and what effect the demonstration of the bomb’s devastating power would have on postwar diplomacy, particularly on America’s uneasy wartime alliance with the Soviet Union. The ongoing struggle to present the history of the atomic bombings in a balanced and accurate manner is an interesting story in its own right, and one that has occasionally generated an enormous amount of public debate. In 1995, anticipating the 50th anniversary of the end of World War II, the Smithsonian’s National Air and Space Museum planned a display around the fuselage of the Enola Gay, the aircraft that dropped the first bomb, for its museum on the National Mall. That exhibit would place the invention of atomic weapons and the decision to use them against civilian targets in the context of World War II and the Cold War, provoking broader questions about the morality of strategic bombing and nuclear arms in general. The atomic bombings of the cities of Hiroshima and Nagasaki in Japan were conducted by the United States during the final stages of World War II in August 1945. The two bombings were the first and remain the only use of nuclear weapons in warfare. The design for the exhibit quickly triggered an avalanche of controversy. Critics charged that it offered a too-sympathetic portrayal of the Japanese enemy, and that its focus on the children and elderly victims of the bombings at Hiroshima and Nagasaki encouraged visitors to question the necessity and morality of the weapons. As originally written, those critics alleged, the exhibit forwarded an anti-American interpretation of events surrounding the atomic weapons’ use. That such a message was to appear in a national museum amplified the frustrations of critics (especially veterans’ groups), who believed that the exhibit should not lead museum goers to question the decision to drop the bomb or to portray the Pacific war in morally neutral terms. In place of the original exhibit, veterans’ organizations offered a replacement exhibit with a very different message. Their proposed exhibit portrayed the development of the atomic weapons as a triumph of American technical ingenuity, and the use of both bombs as an act that saved lives—the lives of American soldiers who would otherwise have had to invade the Japanese home islands, and the lives of thousands of Japanese who would, it was assumed, have fought and died with fanatic determination opposing such an invasion. ‘The revised exhibit removed the questioning tone of the original, replacing it with more certainty: the use of the bombs, it argued, was both necessary and justified. The skeletal remains of what has become known as the “A-bomb Dome.” It is the sole remaining structure damaged by the blast. It was formerly the Hiroshima Prefectural Products Exhibition Hall. All other bomb ruins were demolished. “If the war dragged on and Americans had to invade Japan, it might cost a million lives…life for life, the odds were that [the atomic bomb] would cost less.” Later textbooks made other compromises. The 2005 textbook A History of the United States adopts a familiar tone, arguing that President Truman based his decision to drop the bomb mainly on a complex calculus of the cost in human lives if the war were to continue: “Should the United States use the atomic bomb? No one knew how long Japan would hold out.” That uncertainty forced American planners to assume the worst: “If the war dragged on and Americans had to invade Japan, it might cost a million lives. The carefully written passage does not suggest that the question of whether to use the bomb against civilian targets was part of the debate; it describes the inquiry as focused on where to drop the bomb and whether a warning would precede its use. More recent textbooks often offer viewpoints from other perspectives—including Japanese civilians, who suffered the legacy of atomic fallout for decades after the original explosion—from a morally neutral stance, inviting (or directly asking) readers to make their own judgments. Over the years, particularly during the 1990s, much information related the atomic bombing of the two Hiroshima and Nagasaki has been declassified, but still a discussion that focuses primarily on the need to employ the bomb in order to save lives—the lives of Japanese civilians as well as those of American soldiers—is incomplete. In fact, as the documentary record shows, there was a good deal of debate over the use of atomic weapons during the summer of 1945. 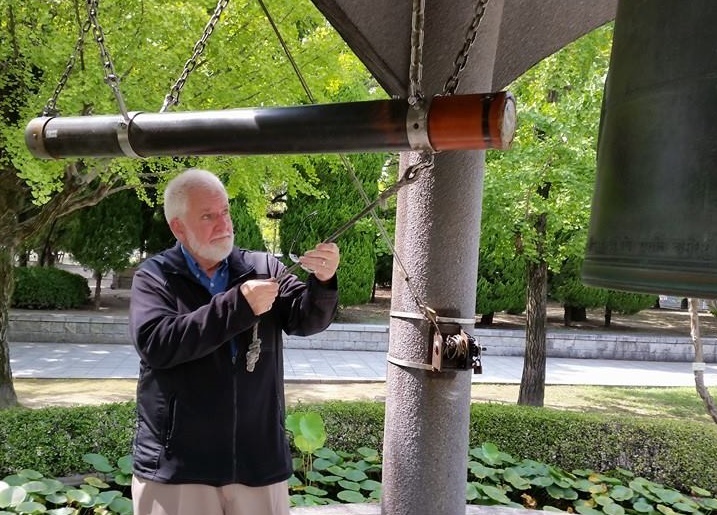 Sam is privileged to ring the Peace Bell in Hiroshima’s Peace Park. “I rang it with the Middle East in mind,” he said. Though firm in its assertions, the SBS received widespread criticism from many quarters for drawing conclusions considered “far beyond the available evidence.” But, the Strategic Bombing Survey’s conclusions highlight another important factor in the decision to employ the bombs against Japan: the message such a display would send to Josef Stalin. Uneasy allies in the war against Germany, Russian forces had joined the war in Japan in August 1945. Contemporary observers noted that the demonstration of the deadly new weapon’s considerable might had the additional effect of warning Stalin that the U.S. would exercise considerable power in the postwar period. Furthermore, dropping two bombs only days apart had the added benefit of convincing the Russians that the U.S. possessed a formidable supply of the new weapons; when in fact, the U.S. nuclear arsenal was entirely depleted after the two attacks on Japan. A survey of primary sources from the summer of 1945 and the months afterward reveals a variety of opinions, arguments, and justifications regarding the use of atomic weapons. Embracing the variety of opinions while also presenting a narrative that depicts the decision and its effects from multiple perspectives is a near-impossible task. Given how controversial the story of Hiroshima and Nagasaki has proved to be, the compromises 21st-century textbooks have undergone appear understandable if not entirely necessary. The real mortality of the atomic bombs that were dropped on Japan will never be known. The destruction and overwhelming chaos that followed made orderly counting impossible. It is likely that the estimates of men, women and children who died in Hiroshima (140,000) and Nagasaki (75,000) are far too conservative. 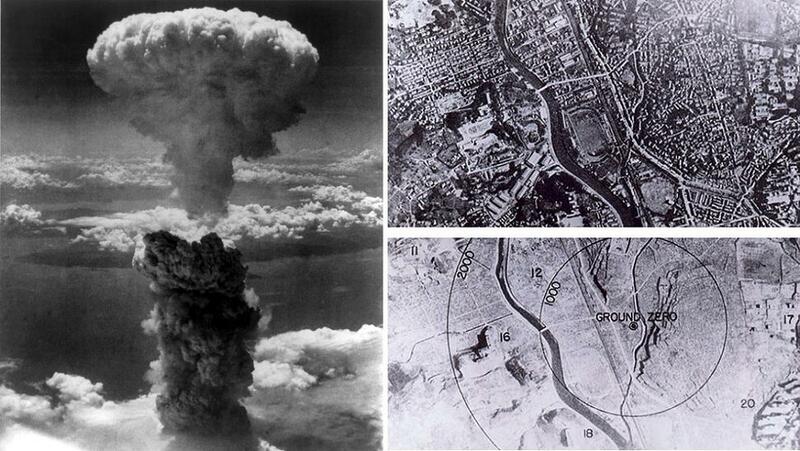 On August 6, 1945, at 8:15 AM, in Hiroshima an estimated 70,000 people were killed instantly. The heat from the bomb was so intense that some people were simply vaporized in the explosion. Some who survived the initial blast threw themselves in the Ota River seeking relief from their burns. There thousands drowned. Within the next four months another 70,000 would die from the effects of radiation and sustained blast injuries. Still, thousands more suffered from the long-term effects of prolonged radiation sickness. 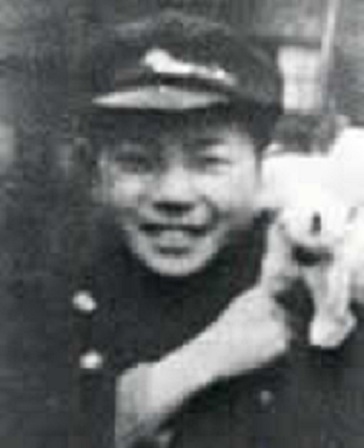 Masayuki, Ueda, a first-year student at the Hiroshima Municipal Junior High School., was one of more than 6,000 students who died from the blast. Little remains of the effects of the atomic bombing in Hiroshima except for artifacts in the city’s Peace Memorial Museum and Park and the skeletal remains of the Atomic Bomb Dome. The city has been rebuilt. Nearly 70 years has passed since the atomic bombings and the end of war with Japan. 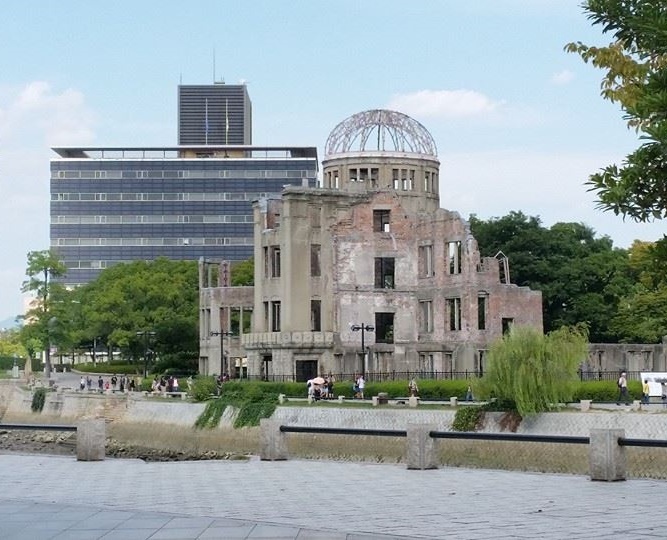 The Hiroshima Peace Memorial Museum and Park now seeks to preserve survivor experiences and has as its major objective the ending of all war and promoting world peace. My hotel was but a block away, so I was able to visit the Peace Museum often during my stay. One of the exhibits that was very moving was that about three junior high school students whose lives were ended by the blast. More than 8,400 Japanese first and second-year students from the Hiroshima Municpal Junior High School had been assigned to demolishing old buildings as a means of creating firebreaks should the city face saturation bombing from Allied planes. 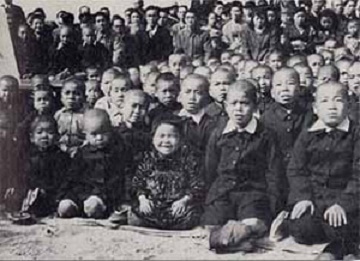 More than 6,000 of these children died when atomic blast took place in the sky above them. The exhibit showed clothing from three of the students who died. There was the cap belonging to first-year student Eiichi Tsuda. There was the uniform belonging to second-year student Hajime Fukuoka, and there were gaiters (a covering worn over the shoes and lower pants legs) belonging to first-year student Masayuki Ueda. The museum exhibits powerfully communicate the need for world peace and an end to war. Outside the museum I found myself surrounded by many smiling Japanese junior high school students. Their ages and faces appeared the same as the young students I had seen featured in the exhibit. Easily recognizing me as an American, they began to encircle me. Not knowing what to say, I asked if they spoke English. They excitedly reached out to shake my hand, saying almost in unison, “Hello, mister. How are you?” I shook their hands and greeted them. Akemi tells me she has dedicated her life to ending war and nuclear proliferation. She was truly inspiring. Akemi points out that today’s nuclear weapons are thousands of times more powerful than that single atom bomb dropped on Hiroshima. “And there are thousands of them,” she says. “That’s why nuclear disarmament is so important. The world must eliminate these weapons.” Akemi is right. A history of nuclear arms race is portrayed in a timeline prepared by the International Campaign to Abolish Nuclear Weapons (ICAN) indicates today’s wide proliferation of these destructive weapons of war could destroy the world a thousand times over within just a few minutes. Even a relatively small regional nuclear war could trigger an international “nuclear winter.” It would cause droughts for more than a decade, researchers say. I am convinced Akemi has it right, and so did General Eisenhower. What the Japanese did at Pearl Harbor was evil and wrong. But I am also persuaded from my research, that I now fully agree with Eisenhower–that what America did to Hiroshima and Nagasaki was also wrong. 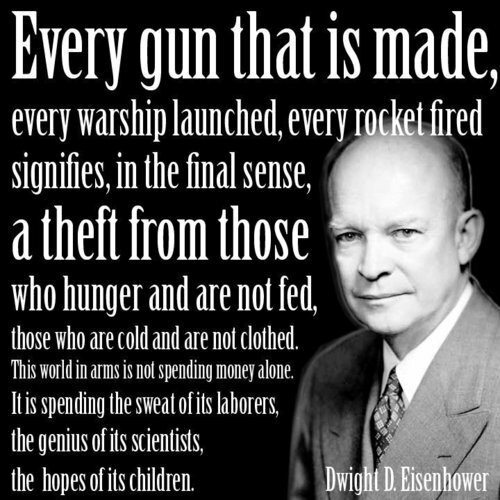 It was in Eisenhower’s words “unnecessary.” And as he predicted, America had also become known as the only nation to have ever used nuclear weapons in time of war. Now Akemi tells me something I never knew. In addition to the more than 140,000 Japanese who died immediately or during the following four months, there were at least 12 American POWs who died on that fateful day. We stare into a computer screen in the research library. She points to the names of the 12 Americans that are listed there. I quickly write down the names: Raymond Porter, Ralph Neal, Joseph Dubisnky, Durden Looper, Buford Ellison, Charles Baumgartner,John Hantschel, James Ryan, Hugh Atkinson, Norman Brisette, John Long and Julius Molnar. I learn that the death of these American POWs was not acknowledged by the United States until the late 1970s. The Japanese have now added the names of the twelve soldiers to their official tally of those killed in the bombing, and the photos of these POWs are now mounted in the Peace Memorial Museum photo gallery. During a 1947 memorial ceremony, some of the thousands of “A-bomb orphans” on Ninoshima Island gathered to honor their parents and friends who had died. “There were thousands of them,” she says. These were children 8 to 11 years old who had been evacuated to the countryside for wartime safety. Though their parents had met a horrific death, they had been spared, but at what cost? Their lives had been horribly changed by the tragedy of war! 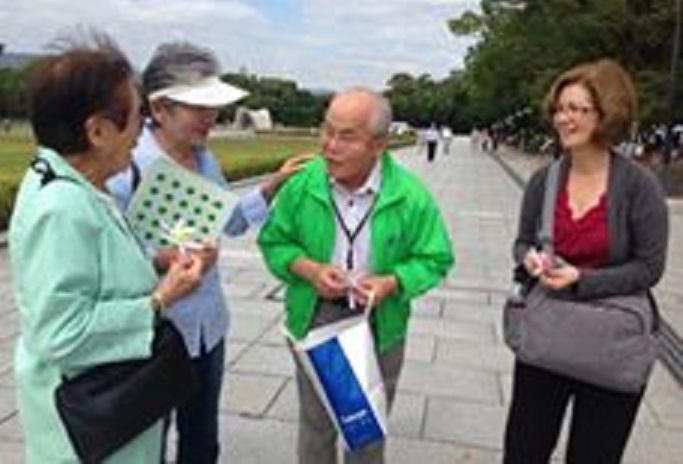 Akemi Yagi and Shouzou Kawamoto (center) share their stories with visitors in the Hiroshima Memorial Peace Park. Both have dedicated their lives to promoting world peace and nuclear disarmament. “A-bomb survivors faced a lot of discrimination,” Akemi adds, “especially when they tried job hunting or getting married.” Shouzou felt hopeless to escape the difficulties of life in Hiroshima. He saw a help-wanted ad on the door of a neighborhood noodle shop. He walked inside and was hired.” Many years later, when Shouzou was 50 years old, he started a very successful business making lunch boxes. Akemi tells me he never married. Decades had passed with little contact with his former acquaintances in Hiroshima. One day he received an unexpected phone call. He was invited to join other classmates at a school reunion. After years of healing from the traumatic scars of war, Shouzou now felt a great longing to be reunited with his classmates. He found understanding, sympathy and hope from those who had also experienced the atomic bombing. Ten years later, now 70 years old, Shouzou would close his lunch box business in Okayama and return to live Hiroshima. 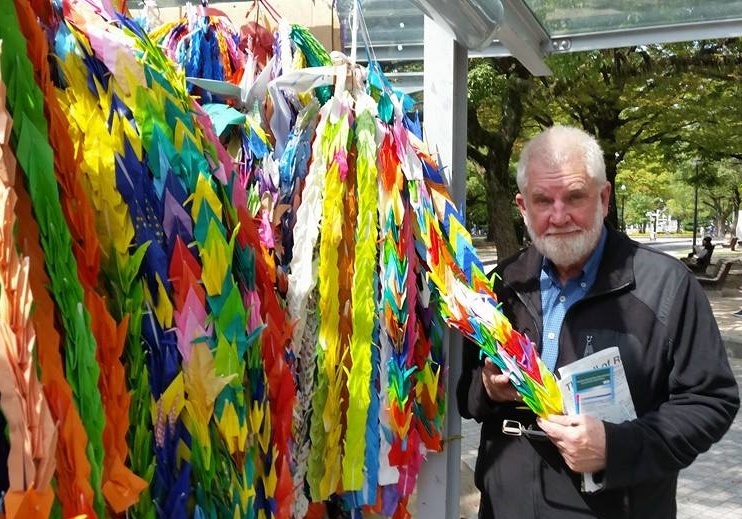 Sam with some of the origami paper cranes mailed by school children from around the world in remembrance of Hiroshima’s war children and to promote world peace. While continuing our walk through the Peace Memioral Park I notice brightly colored paper cranes hanging nearby. Akemi begins to tell me the story of a young girl named Sadako Sasaki who made origami cranes. Sadako was two years old when she was exposed to the radiation of the A-bomb. She had no apparent injuries at the time. She grew into a strong, healthy, beautiful girl. However, nine years later, in the fall of 1954, shortly after entering the sixth grade of Nabori Cho Elementary School, Sadako suddenly developed signs of an illness. By February of the following year she was diagnosed with leukemia and was admitted to the Hiroshima Red Cross Hospital. Believing that folding paper cranes would help her recover, Sadako kept folding and folding, but on October 25, 1955, after an eight-month struggle with the disease, she passed away. Sadako’s death triggered a campaign to build a monument where people could pray for world peace. It also offers the world’s children a peaceful response to remember the children killed by the atomic bomb. The Children’s Peace Monument in the middle of the park was built with funds donated from all over Japan. Later, this Sadako’s story spread around the world, and now, approximately 10 million cranes are presented each year to the Children’s Peace Monument. Following our visit to the Children’s Peace Memorial, Akemi takes me into the Ground Zero Museum and Research Library. There we enter a theater. She says what I am about to see is very important. As the documentary film Children of Hiroshima begins to play I am immediately moved to tears as child after child describes life during and after the atom bomb fell. I now ask you, for the cause of world peace and ending war, for the sake of future generations, please, please watch this short 15-minute film which I have posted below. Children of Hiroshima is based on the eyewitness accounts of Japanese children who were present when the atomic blast occurred. Share this video with your family and friends, and get involved, like Akemi and Shouzou, in campaigning for world peace. Sources: US Strategic Bombing Survey, UPI, Hiroshima Memorial Peace Museum, The Nation, US Department of Defense, wikipedia.org, atomicbombmuseum.org, National Geographic Magazine, youtube.com, Children of Hiroshima, teachinghistory.com, A History of the United States, The Americans, Harry S. Truman Presidential Library, United States Archives, Stars & Stripes, livescience.com, International Campaign to Abolish Nuclear Weapons. Scores of South Koreans wait their turn to get a glimpse of the Demilitarized Zone and North Korea. The two nations have been in a state of war since 1951. Hope remains that one day the two nations will be reunited. The Korean War (1950 to 1953) was a war between North and South Korea, in which a United Nations force led by the United States was fighting alongside the South, and China, assisted by the Soviet Union, was fighting alongside the North. The war arose from the division of Korea at the end of World War II and from the global tensions of the Cold War that developed immediately afterwards. The Korean Armistice Agreement is the treaty which ended hostilities between North Korea and South Korea. It was signed by U.S. Army Lieutenant General William Harrison, Jr. representing the United Nations Command (UNC), North Korean General Nam Il representing the North Korean People’s Army, and the Chinese People’s Volunteer Army. The armistice was signed on July 27, 1953, and was designed to “insure a complete cessation of hostilities and of all acts of armed force in Korea until a final peaceful settlement is achieved.” So far, no “final peaceful settlement” has been achieved. During the three years of war, South Korea had suffered 217,000 military casualties and more than 1 million citizens had died. North Korea had suffered 406,000 military casualties and an estimated 600,000 of its citizens had been killed. According to the US Department of Defense, more than 30,000 US troops died and another 103,284 were wounded. Thousands of troops are still classified as POWs or MIAs. If we could push a button and end war on planet Earth we would no doubt do it. Such statistics as mentioned above are grim reminders that war is never a good response to disagreements and conflicts. We must find far better ways to negotiate a just and lasting peace. 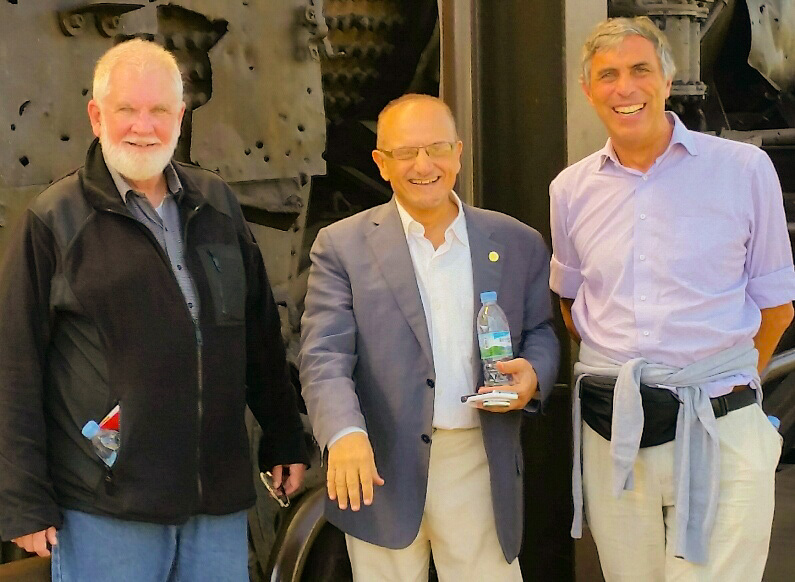 Sam with his friends Dr. Sadig Malki and Bernard van Maele at the DMZ. At the end of the World Peace Summit in Seoul, my colleagues, Dr. Sadig Malki from Saudi Arabia, and Bernard van Maele from Belgium, and I grabbed a taxi from in front of the Seoul Renaissance Hotel and took off for the Korean Dimilitarized Zone (DMZ) some 50 kilometers to the north. It is 250 kilometres (160 miles) long, approximately 4 km (2.5 mi) wide. The name “Demilitarized Zone” is actually an oxymoron. It is in reality one of the most heavily militarized strips of land in the world. Occasional skirmishes and shelling still take place. 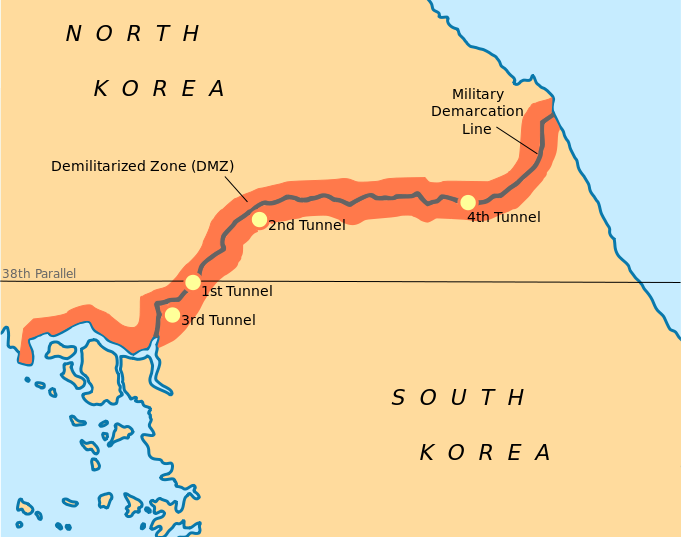 The DMZ cuts the Korean Peninsula roughly in half, crossing the 38th parallel on an angle, with the west end of the DMZ lying south of the parallel and the east end lying north of it. It was created as part of the Korean Armistice Agreement between North Korea, the People’s Republic of China, and the United Nations Command forces in 1953. Our taxi attempted to drive directly to the Dora Observatory, but UN forces waved us away. We were told we had to go to a nearby location and transfer to a tour bus. The Dora Observatory is a large outpost overlooking the DMZ and North Korea. From the observatory, visitors can get an excellent view of the DMZ and North Korean towns and the mountains that lay beyond. This observation post was first opened to the public in January 1987. Hundreds of South Koreans crowded around telescopes as they sought to get a glimpse of life in North Korea. Looking through a telescope, I didn’t see any sign of movement or life. I didn’t see any people walking around or any traffic on the streets. It reminded me of my first visit to Berlin, Germany, in 1967. I was just 18 years old. I had walked along the Berlin Wall. On one side of the wall I saw the bustling businesses and tall skyscrapers of West Berlin. On the East Berlin communist side there was little evidence of economic growth or activity. It was as though I was peering into a time warp. Many buildings still lay in ruins from World War II. Sam and Korean friend Lee take the tram through one of the access channels to Tunnel Two. At our first stop, Bernard, Sadig and I walked through a DMZ museum where we learned about the possibility of visiting a network of tunnels that had been dug by the North Korean military. We were told they are “invasion tunnels” that were meant to send infiltrating forces into South Korea. According to one declassified intelligence report I read, it is believed that North Korea began digging the tunnels after then president Kim Il-sung issued the September 25, 1971, Combat Readiness Order. In that directive, Kim stressed the need to dig tunnels under the Demilitarized Zone, saying that “one tunnel would be more effective than 10 atomic bombs” and would thus be the best means of overwhelming the heavily fortified South Korean army. Tunnel One was discovered in November 1974 in the Western Sector of the DMZ near Gorang-po. At an estimated length of 3.5 kilometers, it extends one kilometer south of the Military Demarcation Line that divides the DMZ. The walls and ceiling of the tunnel, 1.2 meters high and nearly a meter wide, are reinforced with concrete slabs. It has the capacity to move an entire regiment through it. The tunnel was lit with lamps connected to 220-volt power lines. Equipped with a narrow-gauge railway, rail cars and drainage devices were also found inside. This tunnel is located only 65 kilometers north of South Korea’s capital Seoul. Tunnel Two winds through several kilometers of granite rock beneath the surface of the DMZ. Twice as wide as Tunnel One, Tunnel Two was discovered in March 1975 in the Central Sector of the DMZ, about 13 kilometers north of the town of Cheorwon. Measuring two meters high and just over 2 meters wide, the arch-shaped tunnel is large enough to move heavy weapons like tanks, field artillery, and armored personnel carriers. More than 30,000 troops per hour could be moved through the tunnel into the South. 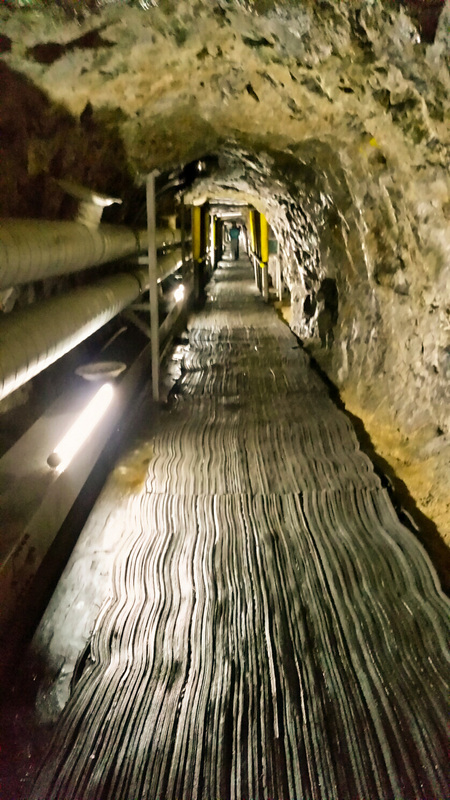 It was bored through 3.5 kilometers of bedrock at a depth of 50-160 meters below ground. A spacious troop assembly area was carved out inside the tunnel. There were three exits from the assembly area leading to the surface. Tunnel Four, which is located along one of the most strategic routes in the Eastern Sector, was discovered in March 1990 only 26 kilometers northeast of Yanggu. This tunnel is buried at an average depth of 145 meters below ground and measures two meters high and two meters wide. Almost identical with Tunnel Two and Tunnel Three in size and structure, Tunnel Four goes just over 1 kilometer south of the Military Demarcation Line and is designed to infiltrate massive forces into the Sohwa-Wontong corridor, the major access route to the Yeongdong Expressway. Donning hard hats to prevent head injuries from hanging rocks, we boarded a small passenger tram, travelling some two kilometers and far beneath the surface into Tunnel 2. The tram had been built by South Korea to provide its citizens with a vivid account of the invasion tunnels that threatened the South. 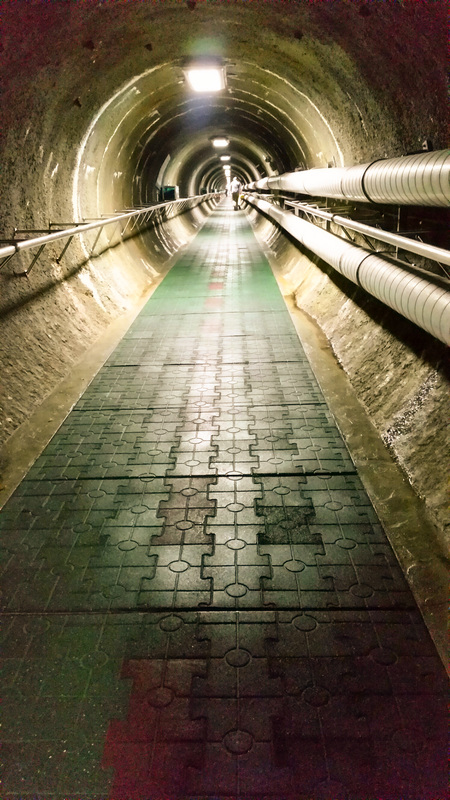 An access channel built by the South Koreans as a conduit to North Korea’s Tunnel Four. This is the two-kilometer upgrade Sam faced when returning to the bus. We eventually surfaced from that tunnel, and I thought I was following Sadig and Bernard into an access channel leading to the much longer Tunnel Four. Towards the end, I realized Bernard and Sadig were not ahead of me, and I was alone in this man-made cavern. I also realized there was no easy way out–not tram or elevator could be found. There I was some 120 meters beneath the middle of the DMZ! I eventually found myself peering through a hole in a door. There was a sign “Restricted Area!” That door, I was told later, led directly into North Korea! I began running up that corridor, huffing and puffing and stopping now and then to lean on the rail to catch my breath. What a tremendous workout! I was wondering how many older men like me had died of heart-attacks alone down there! Despite the posturing and the insults hurled across this narrow strip of land, the DMZ has become a haven for wildlife and plants in the region. 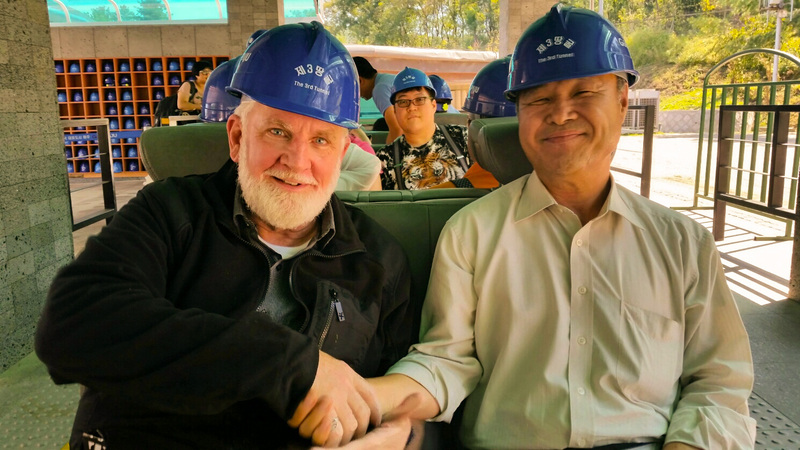 “It’s kind of the irony of war,” said Hall Healy, chairman of the board of the International Crane Foundation, which has worked with researchers and locals near the DMZ on red-crowned crane conservation. Species that have dwindled or disappeared in some parts of Asia have found refuge in the DMZ. Sightings of rare birds, such as red-crowned cranes and white-naped cranes, are not unusual. Black bears, musk deer, and Amur gorals—a goat relative that lives in the mountains—also inhabit this heavily fortified area. 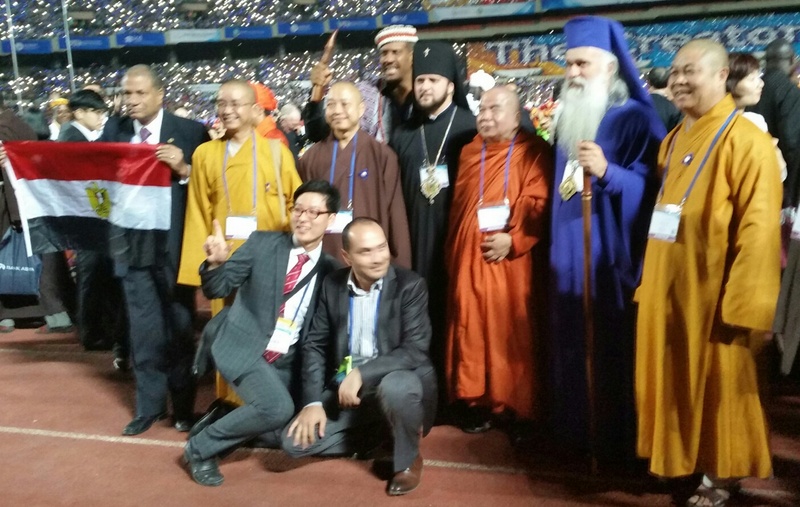 More than 60,000 men and women from around the world gathered in the Seoul Olympic Stadium for the World Alliance of Religions for Peace summit. Among those attending were political and religious leaders and heads of NGOs from an estimated 172 nations. Thousands of cards are assembled in the background to image Roman Catholic Cardinal Gaudencio Rosales, of the Philippines, as he addresses the gathering. Sam flashes peace sign at the opening ceremony of the World Peace Summit in Seoul. The three-day World Alliance of Religions for Peace (WARP) peace summit was held in Seoul, South Korea, 17 – 19 September. I was privileged to join several participants from Saudi Arabia. Our main goal in being present for this huge conclave was to network with other faith leaders from around the world. And that we did! More than 60,000 people from 172 countries took part in the spectacular opening ceremony at Seoul’s Jamsil Olympic Stadium. (Be certain to watch the short video at the end of this article!) Just about all the world’s religions were represented, including the major Abrahamic faiths–Judaism, Christianity and Islam. From the time we arrived in South Korea until the day we left, event staff were among the most hospitable I had ever met. Every detail regarding meetings, lodging, meals and transportation were meticulously well organized. These workers did their very best at all times to make us feel comfortable and kept informed. Present was a diverse line-up of attendees that included former and current heads of state, prominent religious leaders, academics, government legislators, Nobel Prize laureates, as well as community, youth, and women’s leaders from every continent. Sam with Muslim leaders from Oman. There were numerous delegations from the Middle East. Egyptian Grand Mufti Shawqi Abdel Karim Allam was among the list of high profile speakers set to deliver an opening address, but he was unable to attend at the last minute and was replaced by Doha (Qatar) International Centre for Interfaith Dialogue chairman Dr. Ibrahim Saleh Al Naimi. The Qatari official stressed the importance of dialogue in his speech, describing it as the only way to address conflict among communities. Bahrain sent a 20-strong delegation from the Bahrain Association for Religious Co-existence and Tolerance (BARCT). Yemini Nobel Peace Prize winner Tawakkol Karman championed the cause of peace and women’s rights. Throughout the three-day event there were various leadership seminars and focus groups discussing regional issues and various methods of conflict resolution. In recent years, peacebuilding initiatives have been on the forefront of leading a country’s economic, social and political strength, laying the foundation for development and conflict management. Sustainable peace can, however, present its own challenges as it calls for a nation to gather its utmost efforts across a wide range of activities. Among important efforts are establishing security on a nation’s borders, providing assistance to refugees, organizing elections of new governments and financing programs towards the protection of human rights. Preventive measures and integrated strategies are greatly needed to assist in the development of best practices , especially in postwar recovery and reconciliation. 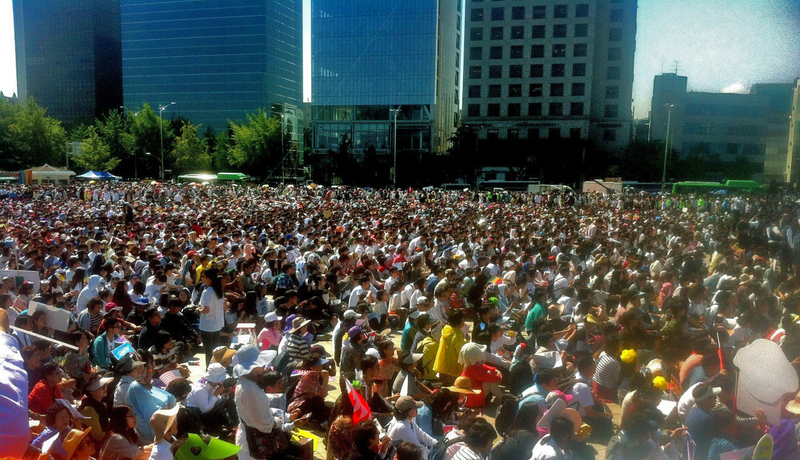 The closing of the Peace Summit saw more than 100 thousand people rally in the peace parade which culminated at the Peace Monument in the Seoul Olympic Park. The closing ceremony included an hours-long Olympic-style show replete with fireworks, marching bands and celebrants. Korean theatrics created an emotional display of pomp and pageantry. 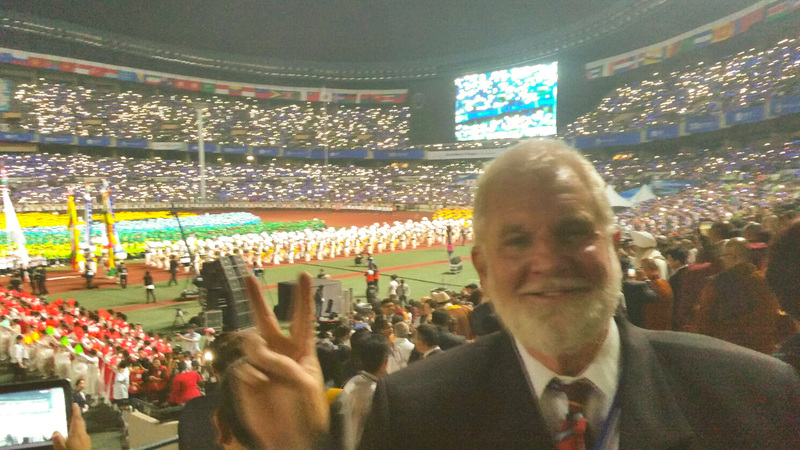 At the end, many of us joined the Koreans on the field for photos and well wishes. There were speeches by various youth leaders from many countries and all of them spoke of sufferings in their respective countries and the need for world peace to end the wars in their regions. Chairman Lee said that world peace is attainable if all the leaders of various religions aggressively continue their efforts to attain world peace. He emphasized the role of religious leaders to encourage their communities to work closely together and also asked the media to promote peace messages around the globe. 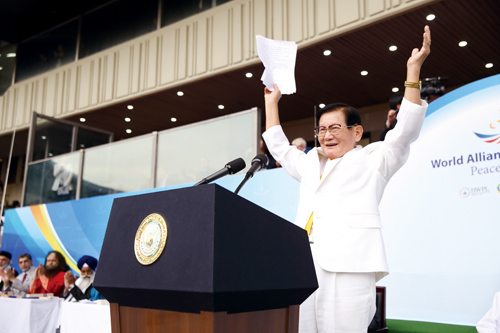 Man Hee Lee welcomes participants to the Peace Summit. While I applaud the efforts of the World Alliance of Religions for Peace to have conducted this international Peace Summit, these efforts have seemingly been based on the leadership of one single man–Chairman Man Hee Lee. Faith leaders from all major faiths and 170 nations met for discussions on war and peacemaking. World peace is certainly a noble goal. And, without a doubt, dialogue among the world’s major religions and faiths is needed. Many of the conflicts and wars taking place today are caused by religious extremists who have hi-jacked faith for their own political purposes. Such is the case of ISIS (IS or ISIL) and other militant groups now committing horrible atrocities in the name of Islam. During the past millennium we have seen such circumstances time and time again as even Christians annihilated Muslims, leading their warring military charges under the cross of Jesus in their Crusades to capture the Holy Land. War was conducted on numerous occasions by Catholics who sought to blot out the “heresy of Protestantism” or as World War II Nazis sought to destroy Judaism. Such evil is also seen today as Israeli Zionists continue a 60-year war of ethnic cleansing, seeking to remove millions of Palestinian Christians and Muslims from the Holy Land or as normally peaceful Buddhists continue a slaughter of the Muslim minority in Myanmar. The need for dialogue among peoples of faith is of utmost importance, but the it appeared that the predominant view of those attending the Seoul peace summit is that this should not entail eliminating any one faith group or merging all faiths into one. There is a beauty in the diversity of faith and tradition. And as we met and discussed our beliefs with many faith leaders from around the world, one thing is certain: no faith on earth, based on its holy books, can justly call for the annihilation of innocent men, women and children who believe differently than they. Therefore, we must all do our part to stop the vicious conflicts and carnage being unjustly perpetrated today in the name of any religion or faith group.